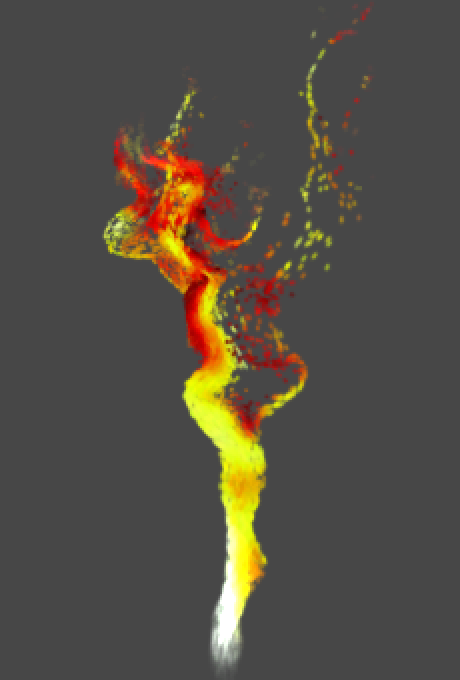 Use 3D Curl noise to simulate volumetric flows. This tutorial comes after the Noise tutorial. I assume you did that one first. 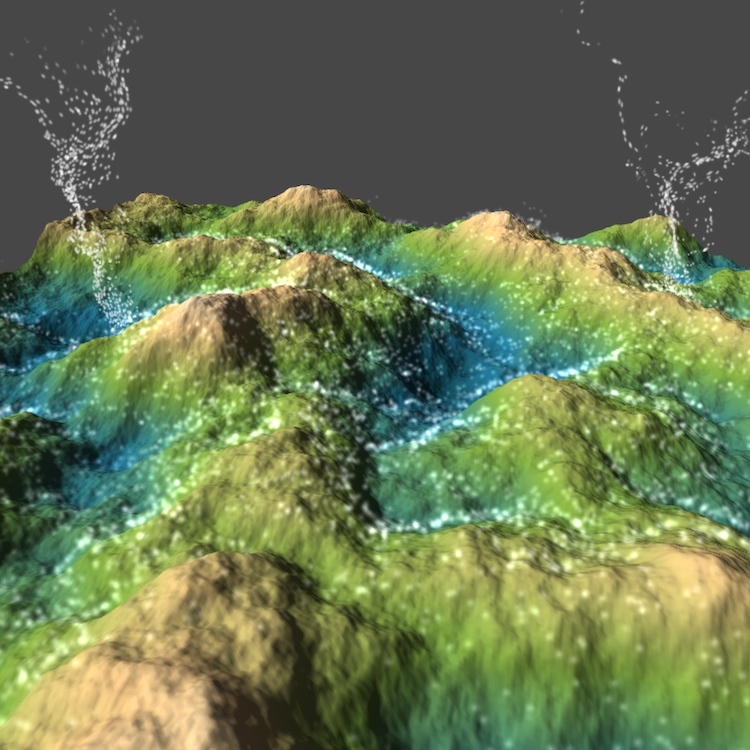 Fun with meshes and particles. 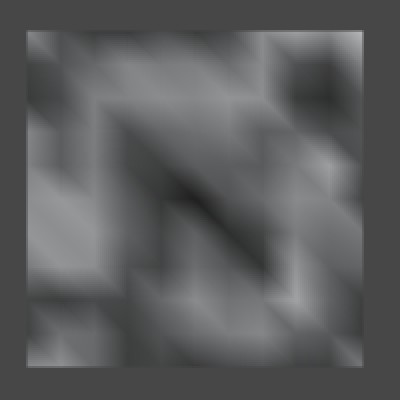 In the Noise tutorial we experimented with coloring a texture based on pseudorandom noise, but that's not the only thing you can do. Another common technique is to deform a flat surface, interpreting the noise function as a height field. Because we'll be using the same noise and roughly the same approach we used for our textured quad, start with the finished project of the Noise tutorial. 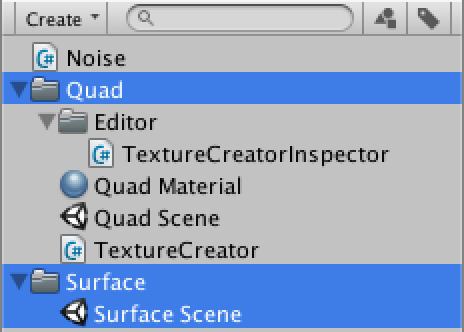 Then move all the quad-related stuff into their own folder and rename things a bit for clarity. We'll put the surface stuff in its own folder too, starting with a new scene. 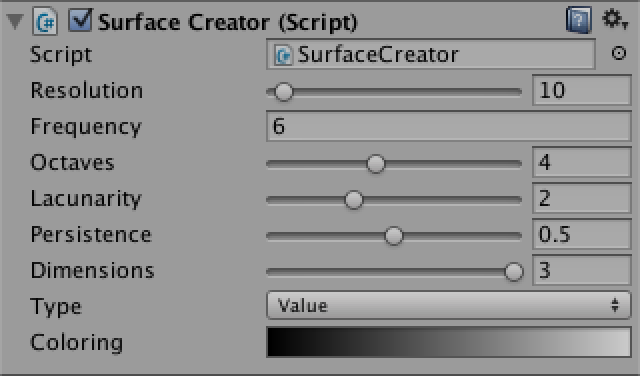 This time we'll be creating a surface, so create a new SurfaceCreator script, along with a new default material for it. 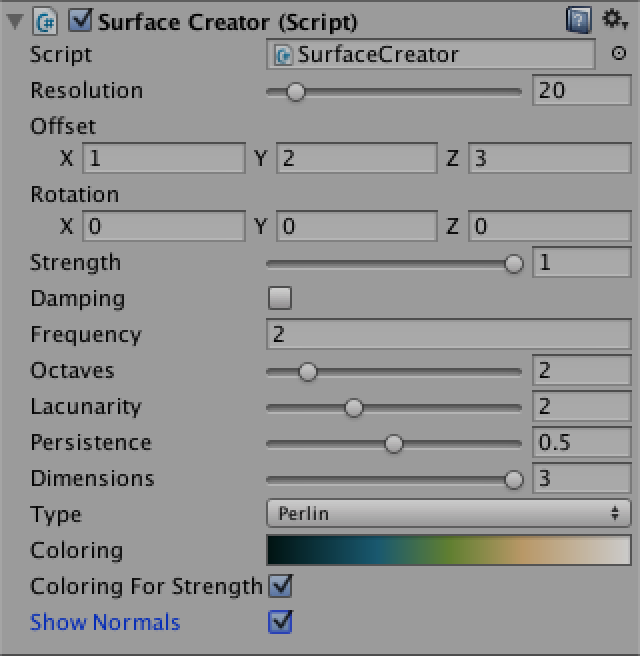 We'll use a mesh to represent our surface, so like with TextureCreator we generate a new one in SurfaceCreator.OnEnable if it doesnt' exist yet, then call a method to refill or refresh it. Of course we also want to make sure that our mesh gets rendered. We do that by assigning it to a MeshFilter component that should be attached to our game object, and making sure that there's a MeshRenderer component attached as well. To make sure those components exist, add the RequireComponent attribute to our script with the types that we need. 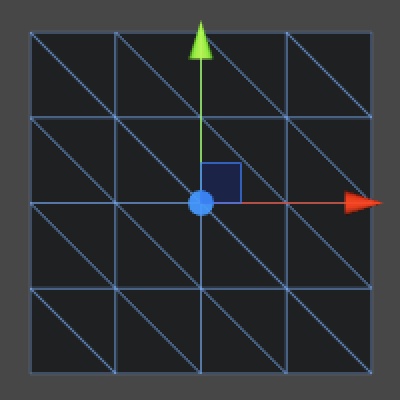 Now when creating a new game object and adding our component to it, the other two components will be added as well. Then we can set the renderer to use our surface material by dragging it onto the game object. 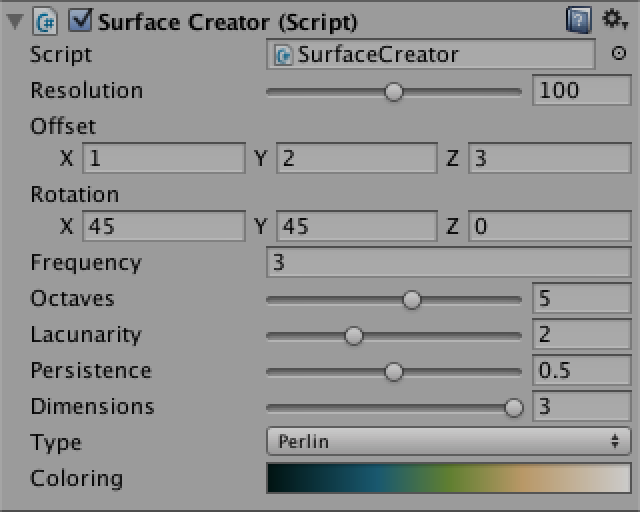 Our TextureCreator component has a handy custom editor which makes sure that its texture is updated as soon as a change is made via the inspector. Let's copy it and turn it into a version that works with our new SurfaceCreator. 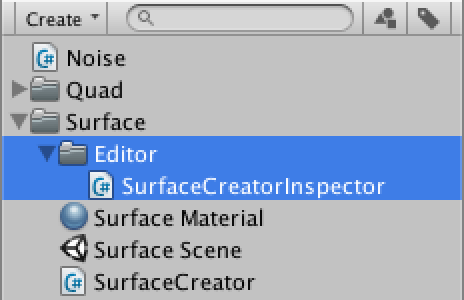 Custom inspector for our surface creator. Right now we only have an empty mesh. We have to add vertices and triangles to it before anything shows up. Let's start with a single right triangle. 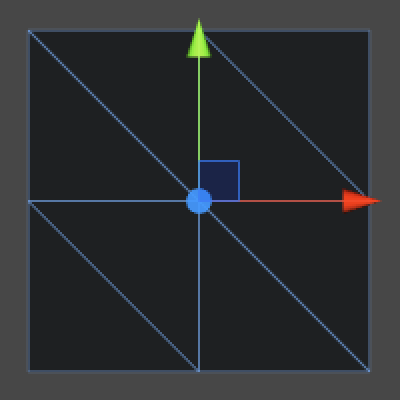 In Refresh, first give an array containing three vertices to our mesh. 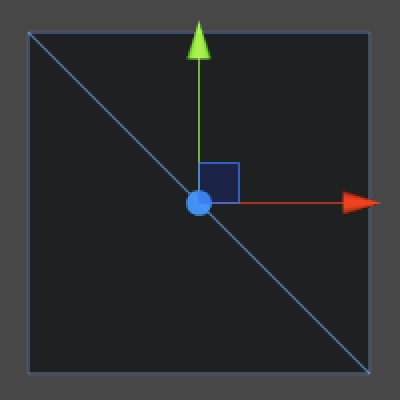 Now that it knows how many vertices it has, we can give it an array of vertex indices that tells it how to draw a triangle. Now a triangle will show up while in play mode, but it is only visible when you look at it in the negative-Z direction. The triangle isn't drawn when looking in the positive-Z direction, because the default material's shader only draws one side of it. This is known as face culling. It is done because you're typically only interested in the outside of a mesh, not its inside. 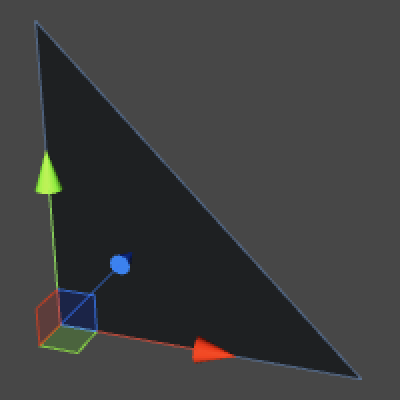 To determine which side of a triangle you're looking at, the shader checks the winding order of its three vertices. 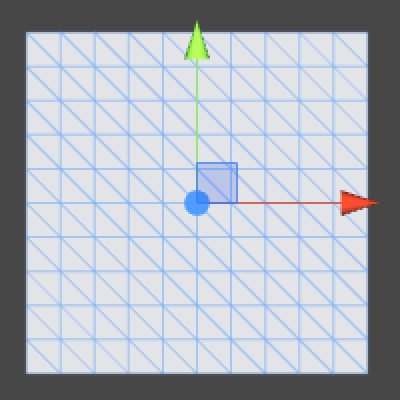 In Unity's case, by default a clockwise order indicates forward-facing triangles that should be drawn, while counterclockwise triangles should be discarded. To to see our triangle when looking down the Z axis, we should switch to a clockwise vertex order. Counterclockwise vs. clockwise triangle, viewed from their appropriate sides. We can turn our mesh into a quad by adding a second triangle to it. First we have to add a fourth vertex so they all form a square. Then we can add three more vertex incides, which causes a second triangle to be drawn. Two triangles forming a quad. A surface that consists of one quad is like a texture that has only one pixel. If we want to show any details, we have to use a grid of smaller quads. So let's add a resolution variable to SurfaceCreator with a range of 1–200. Also add a currentResolution variable so we only recreate the grid when the resolution has changed, just like we did for TextureCreator. 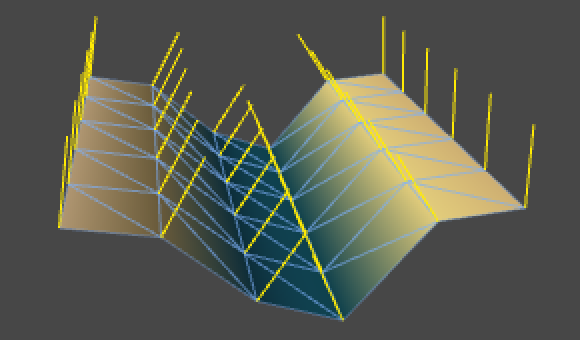 Now replace the fixed vertex array with a double loop over y and x, like for TextureCreator, but with two differences. First, because a quad needs two vertices in both directions, a grid of n2 quads – with n being its resolution – needs (n + 1)2 vertices. Second, as the vertices are placed on the edge of our quad cells and not in their centers, we don't have to offset them by half a pixel. We will still offset the entire quad by -½ to center it on the origin though. As the triangle array requires six vertex indices per quad, its length is 6n2. Filling it is a bit more involved. First, we will loop over y and x in units of quads, which means six triangle indices per step. Second, as each row has n quads but n + 1 vertices, we have to increase the vertex index after each quad, but also after each row. Third, we have to replace the quad indices 0, 1, 2, 3 into offsets relative to the current vertex index. 0 and 1 stay the same as offsets, but 2 and 3 are actually the 0 and 1 of the next row. So we need to add the length of a vertex row to get them, which is n + 1. Now you will see the quad density increase as you slide up the resolution. However, it will go wrong when you try to decrease the resolution. 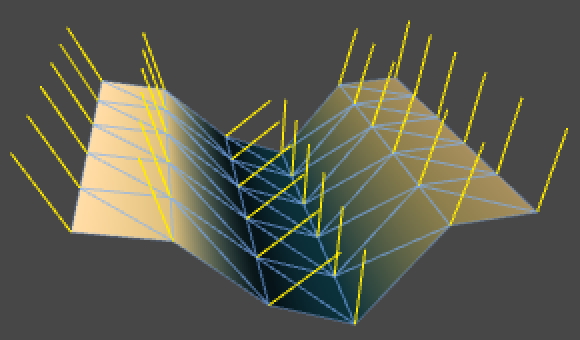 This happens because we try to assign less vertices to the mesh than are currently being used by its triangles. 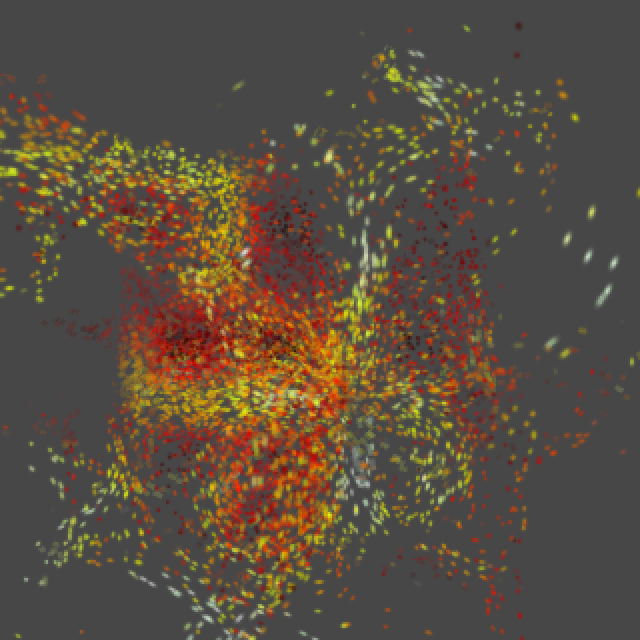 We should clear the mesh data before assigning a different amount of vertices. Mesh resolution 1, 2, 3, and 4. While our vertices and triangles are all good now, Unity keeps complaining that our material's shader wants some stuff that our mesh doesn't have. 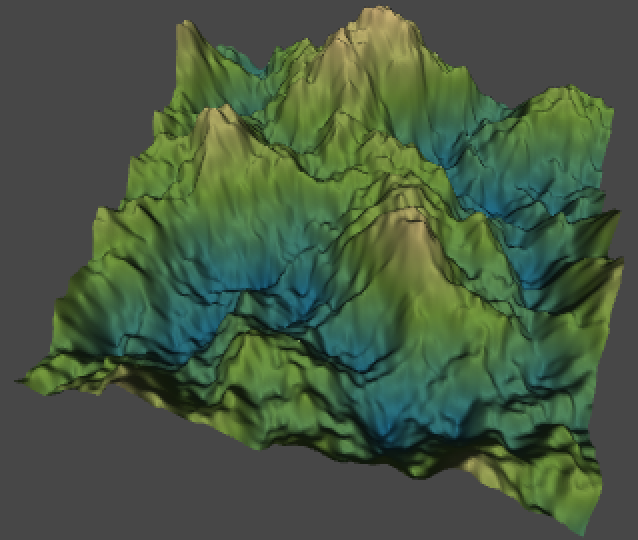 Because the default diffuse shader has a texture to show, it needs to know how to map it onto our mesh. We can either add UV coordinates to our mesh, or use a shader that doesn't need them. As it is quite easy to add them, let's just do so. The other missing elements are the normal vectors. These vectors are used for lighting calculations and are (0,0,1) by default, which is why the counter-clockwise triangle was light while the clockwise ones are dark. If we set them all to (0,0,-1) our grid should be light too when viewed head-on with the scene view's default lighting. 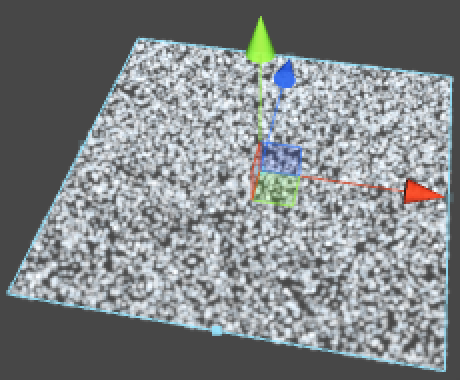 You can also assign colors to vertices, which will be interpolated across triangles, just like bilinear filtering for a texture. Strangely, the mesh remains white even when it has black color data. 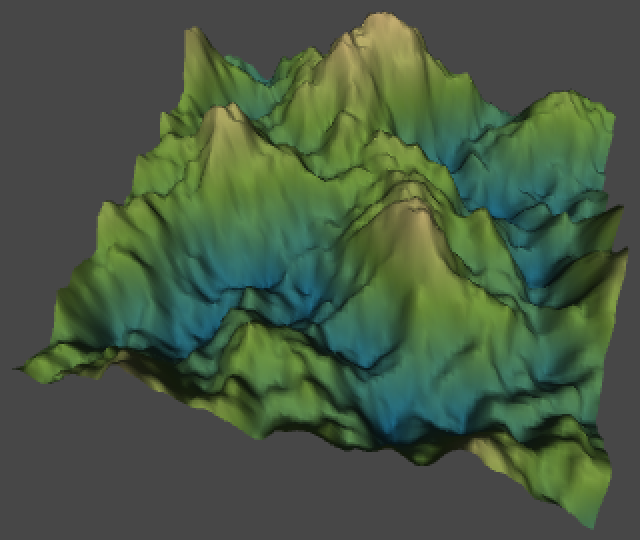 This is because the default diffuse shader does not use the vertex colors. So let's make a shader that does use them. 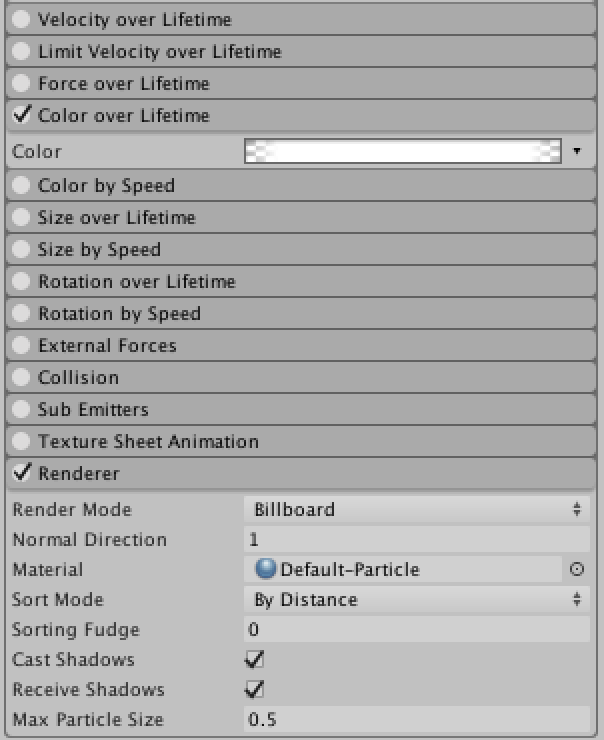 Create a new shader and set our surface material to use it, either by dragging the shader on it or by selecting our shader from the shader list. The mesh will still look the same, because the new shader is the same as the default diffuse shader, except that it doesn't have a main color property. 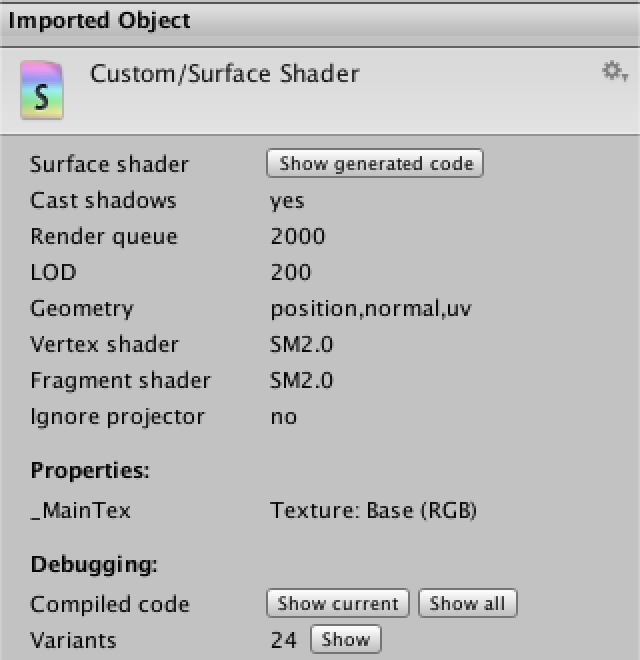 When selecting the shader, the inspector view will show some information about the imported shader object. Note that under Geometry it mentions position, normal, and uv, but not color. 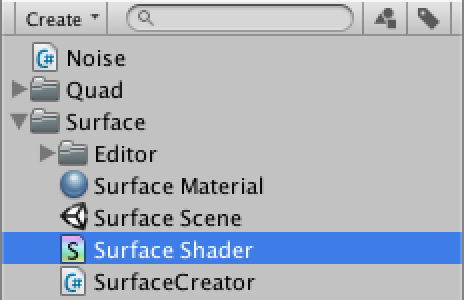 Our custom shader contains Unity's default code for a surface shader. In this case surface does not mean our mesh surface, it refers to Unity's shader solution that takes care of most of the details of multiplatform multipass shader programming for us. 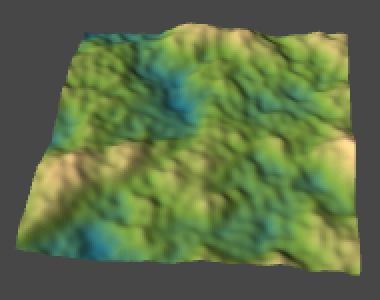 What's left is to set some material properties, like albedo. Here is the default code. The surf method is where the material's properties are set, other than its position and normal. We see that the main texture is used as input and used to set the albedo and alpha. To include color, we have to add it to the input structure and factor it into the result. Let's just use the same data type that's used for the texture sample. The only special thing we need to do is indicate that our color input should link to the vertex color data. It's time to make some noise again! 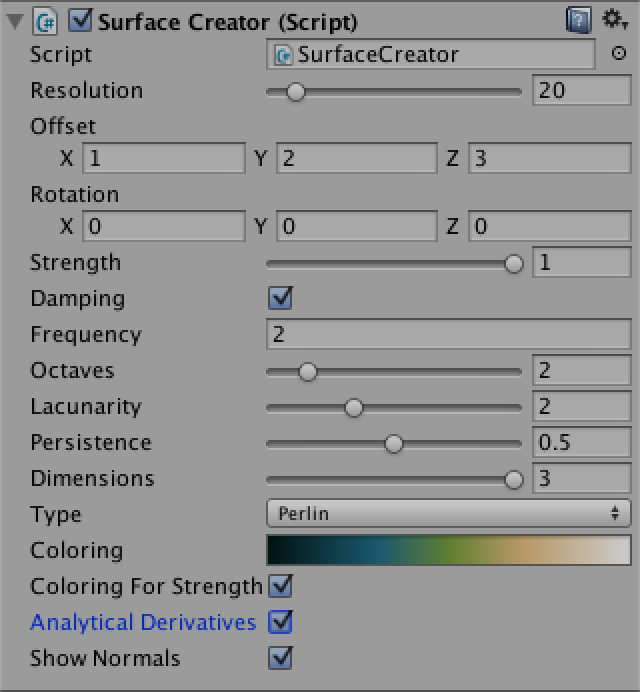 Let's just copy the same noise configuration variables that we used for TextureCreator. We also use the same approach to sample the noise, with some slight tweaks because we're working with vertex data instead of pixels. For this to work we need to promote colors to a class variable instead of only defining it inside CreateGrid. Let's go ahead and do this for vertices and normals as well. Sampled vertex colors at resolution 10, 20, 40, and 80. Now you might want to move the noise sampling away from the origin, but we haven't put in code that checks for a transform change yet, so the mesh won't be refreshed when moving it. We could put this code in to make it behave just like TextureCreator, but this is not really convenient. Instead, let's keep our mesh in a fixed position and add an offset to the noise instead. Let's add support for rotation as well. 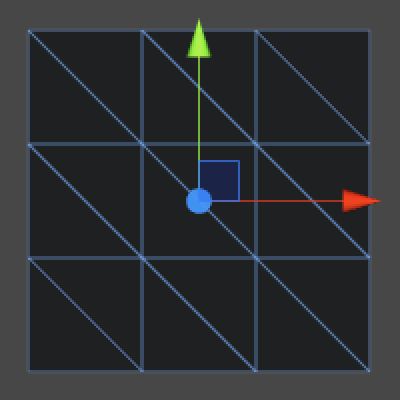 We use a vector to configure angular rotations, but we'll use a quaternion to actually transform our positions. If we multiply the quaternion with our original positions and then offset the result, we act the same as a Transform component would. Noise with offset and rotation. 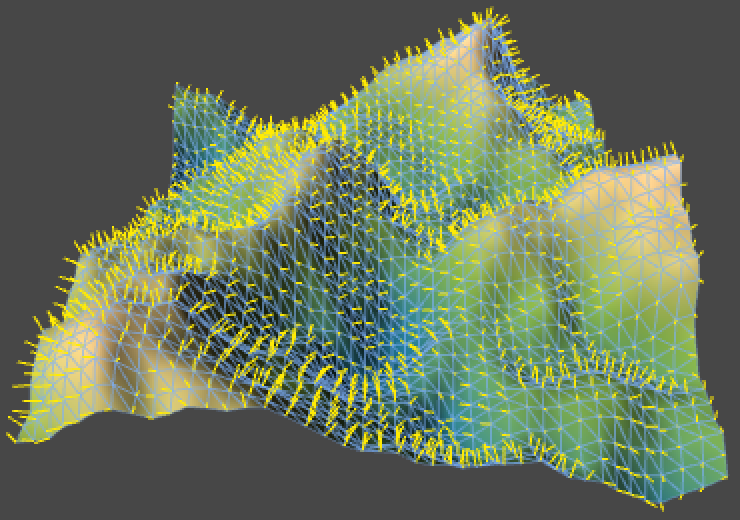 To perturb the shape of our surface, we can simply displace the vertices along the Z axis using our noise samples. We are now displacing a vertical surface, which is a bit awkward to work with. It is easier to work with a horizontal surface, because then it would resemble a terrain, which is something we are all very familiar with. We could rotate our mesh to make it horizontal, but we can also change its construction so is horizontal to begin with. We could also change Refresh so it sample from XZ instead of XY, but then it won't work for 2D noise because that's defined in XY, so we leave our sampling unchanged. We just use the sample to displace Y instead of Z. While we're at it, as our surface goes from -½ to ½ in both horizontal directions, it makes sense for the displaced surface to have the same range vertically. That way it can theoretically be defined anywhere inside a unit cube, but not outside of it. 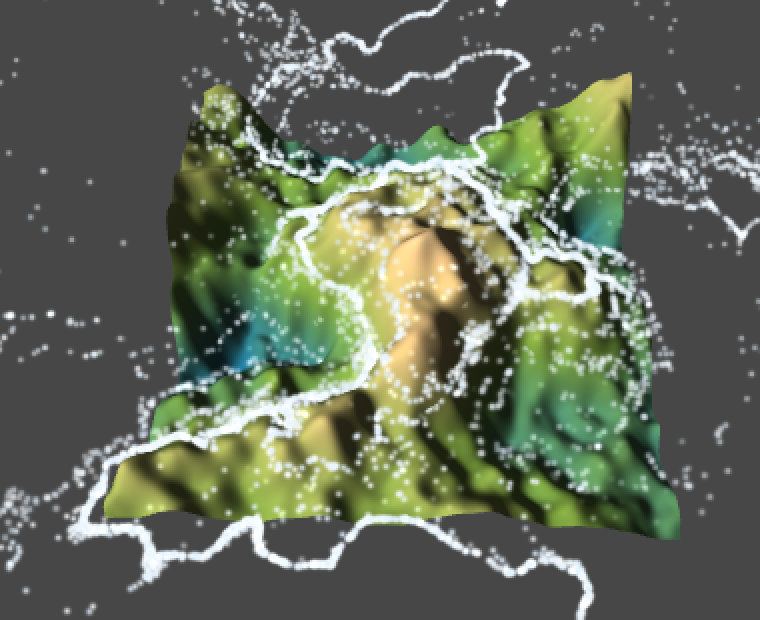 That means we have to subtract half a unit from Value noise and halve Perlin noise. 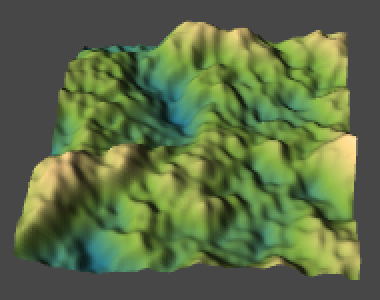 Horizontal surface displaced with Value and Perlin noise. 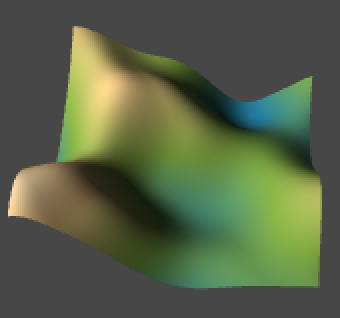 Now when you use a coloring that somewhat resembles terrain strata, you end up with a result that looks a lot like a landscape. For example, I'm using the colors (1,25,34) at 0%, (32,111,139) at 30%, (121,159,61) at 50%, (231,190,129) at 70%, and white at 100%. 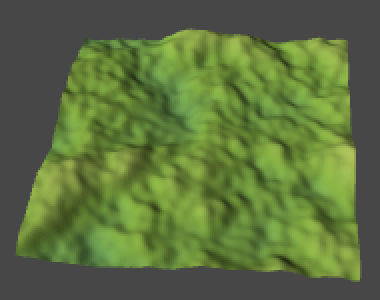 However, this terrain looks rather flat, because all the vertex normals are still pointing straight up, causing the lighting to behave as if it were. 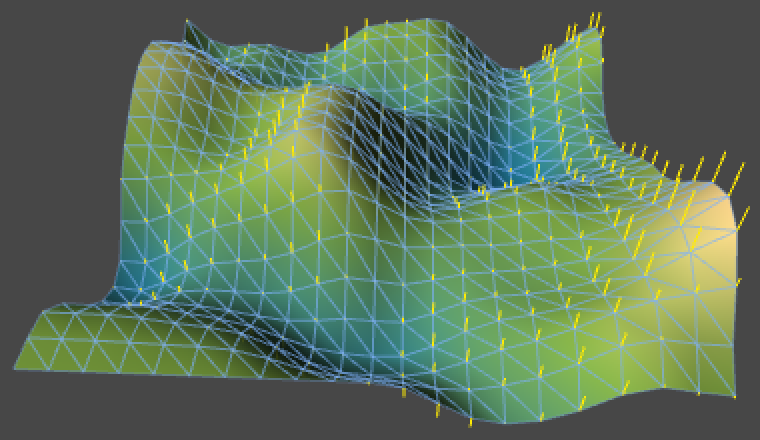 The easiest way to get proper normals is to invoke Mesh.RecalculateNormals after we changed all vertices, so let's do that. 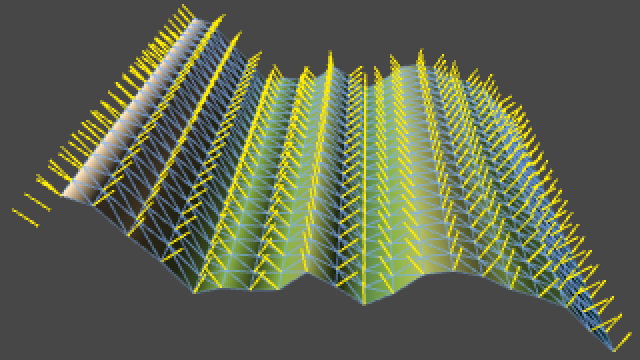 Normals calculated by the mesh, at resolution 100 and 200. The default scene view light always shines in the direction that you're looking, which isn't very interesting. So go ahead and add a directional light so you can change the light's direction. A handy trick is to position yourself in the scene view as if you were a light, and then use GameObject / Align With View with the light selected. That way your current view direction becomes the light's direction as well. Light coming from a different direction, without and with shadows. Right now the noise results in quite strong displacement of our surface. But often we desire a more subtle displacement, so let's add a variable to control the strength of the noise with a range of 0–1. Inside Refresh, we have to scale our sample after it has been brought into the -½–½ range. Strength 1, ¾, ½, and ¼. Of course this means that as strength decreases, you'll see less of the gradient. This is fine if that's what you want, but if it's not then you'll have to evaluate the gradient before scaling the sample. 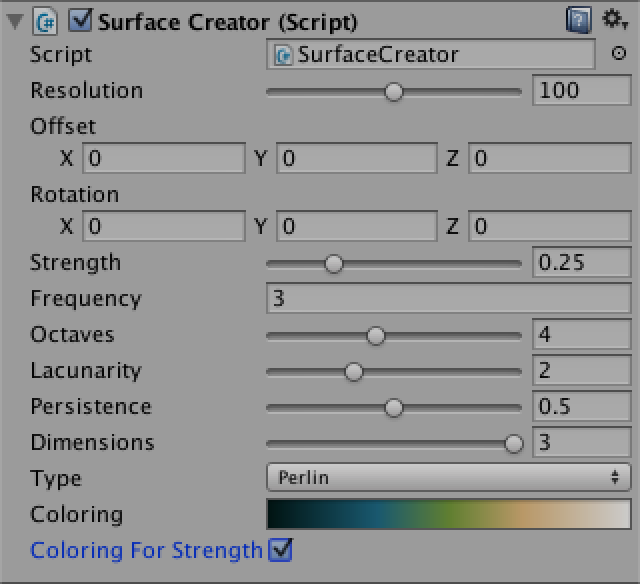 To allow a choice, add a boolean variable named coloringForStrength. Coloring for strength, at ¾, ½, and ¼. There is another phenomenon that we might want to do something about. If we increase the frequency of the noise, the surface deformation becomes a lot more extreme. This happens because the same vertical displacement happens much faster, which basically means that the energy level of our system has increased. If we want to keep the rate of change at a constant level, we have to decrease the amplitude of the noise, just like we do when we sum noise octaves. Let's make this optional with a dampen boolean. If it's on, we divide the strength by the frequency before applying it. Frequency 2, 4, and 8, without damping vs. with damping. Instead of relying on RecalculateNormals, we could also calculate the normals ourselves. Our advantage is that we know the topology of our grid, which means that we can be more efficient. 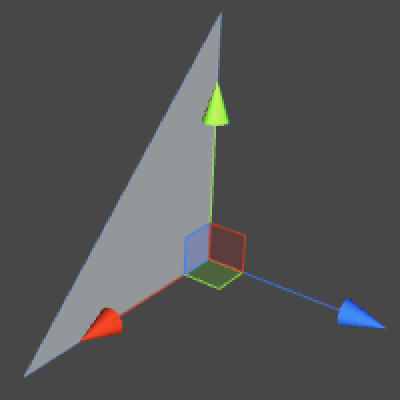 But first, let's add an option to show the normal vectors when we have our mesh selected in the scene view. We can do that by adding another boolean variable and utilizing Unity's OnDrawGizmosSelected event method. Inside OnDrawGizmosSelected, we simply loop through all vertices and draw a gizmo ray using their position and normal. But we only do this when we want to, and also only if the vertex array exists. This extra check is necessary because the gizmos event method can end up being called by Unity before our component has awoken. These gizmos are so large that they're unusable, they should be scaled down. It makes sense to scale based on the resolution of our mesh, that way a vector of unit length becomes as long as the horizontal width of one quad in the mesh. 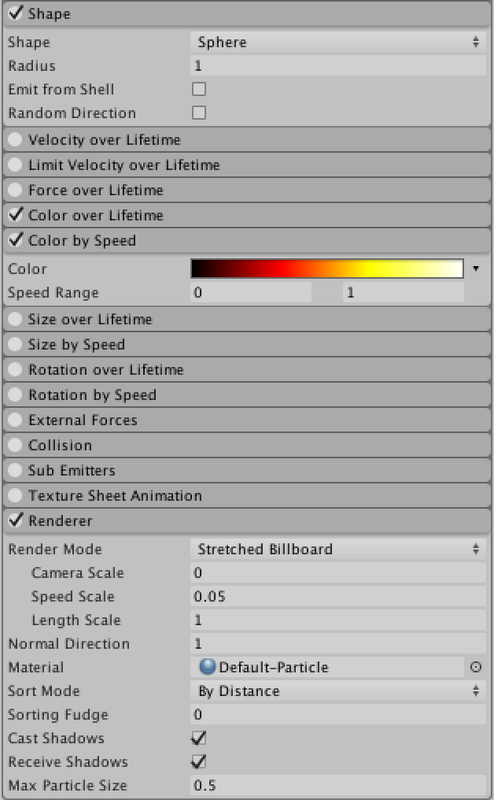 Scaling gizmos at resolution 5, 10, and 20. Right now we're seeing vectors that point straight up. Shouldn't we see the normals of our mesh? No, we're seeing the vectors in our normals array, but these are not the same as the normals currently being used by the mesh. When assigning data to the mesh object, it actually copies what's in our arrays to its own data structures. We're assigning to mesh properties, not variables. That's why we have to assign – actually copy – our arrays again when we change them. Likewise, if the mesh changes its own data, we have to extract it to update our own arrays. 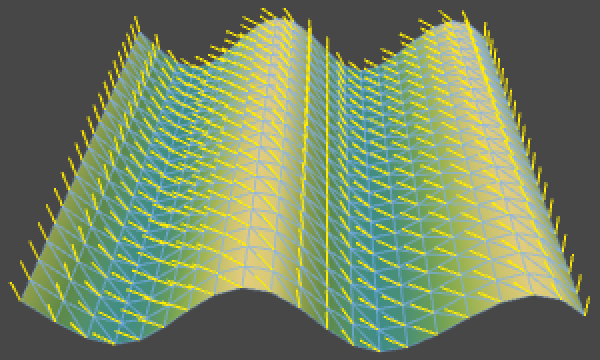 Normals calculated by the mesh itself. To calculate normals ourselves, we have to loop through all vertices and figure out the normal of each one. Because our mesh is a grid, most vertices have four neighbors. If you connect opposite neighbors, you get two lines that form a cross. Those two lines define a plane, which we can consider an approximation of the tangent plane of the slope at the center vertex. If we take the cross product of those two vectors and normalize it, we end up with the normal of that slope. As we consider the two lines lines tangent to the slope at our vertex, then if we scale them so that their X or Z component is 1, then their Y component is the proper rate of change in that direction. Let's go one step at a time, and misuse our normals to show the rate of change – the derivative – of the X direction only. For that reason we won't assign our normals to the mesh just yet. What is the cross product? To get the derivative along the X axis, we have to take the difference between the height to the left and to the right of a vertex, so right minus left. 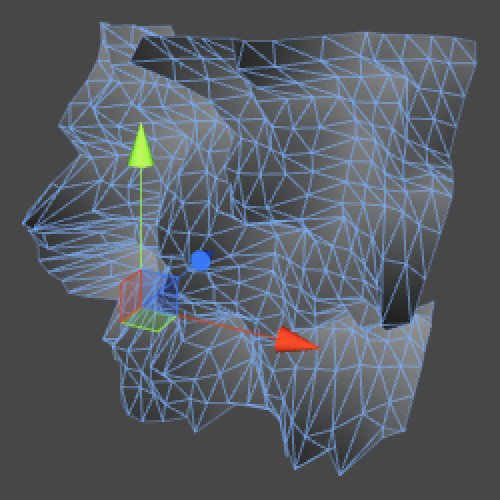 We then have to divide this by the distance between the left and right vertices, which is twice the mesh resolution. How to get the vertex index for x and z? As we're now dividing by a division, we might as well convert it into a multiplication. 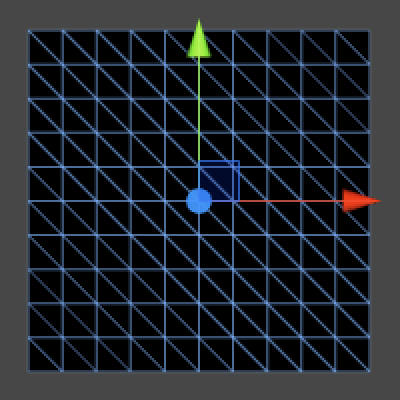 But this approach will only work for vertices that aren't on the edge of the grid. 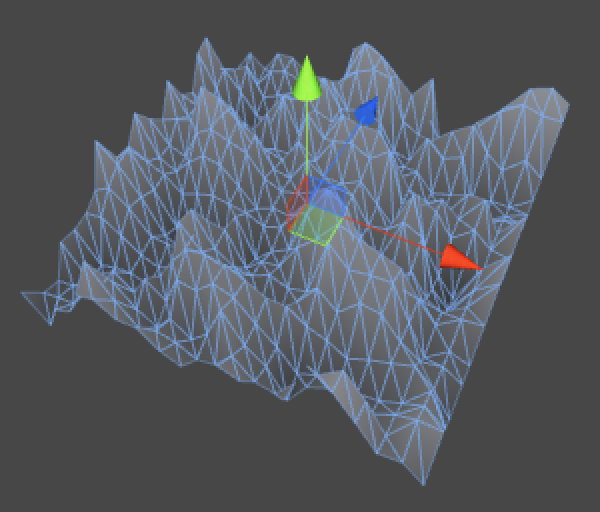 The edge vertices will lack either a left or a right neighbor. In those cases the best we can do is take the difference between the vertex and its single neighbor. As that halves the distance covered, we also have to double the scale. Rate of vertical change in the X direction. To turn this into tangent lines, we have to use vectors of the form (1, derivative, 0). Tangent lines in the X direction. We can do the same thing for the Z direction. Tangent lines in the Z direction. Now if we take the cross product of these two tangent vectors, we'll get a vector pointing along our surface's normal. We have to perform Z-tangent × X-tangent to get them to point upward instead of downward. Because of the nature of our vectors, quite a few parts of the cross product are constant. In fact, we only have to flip the signs of the derivatives. The final step is to normalize the result, so it becomes a proper normal vector for our mesh. 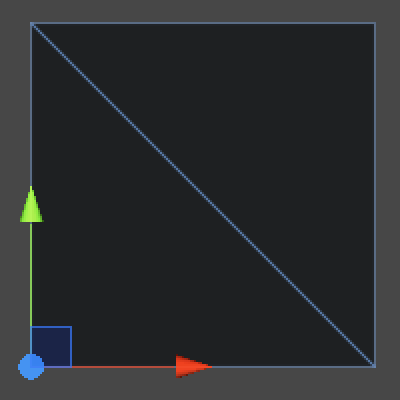 Now we can use our own code instead of relying on Mesh.RecalculateNormals. Note that both approaches produce slightly different normals. 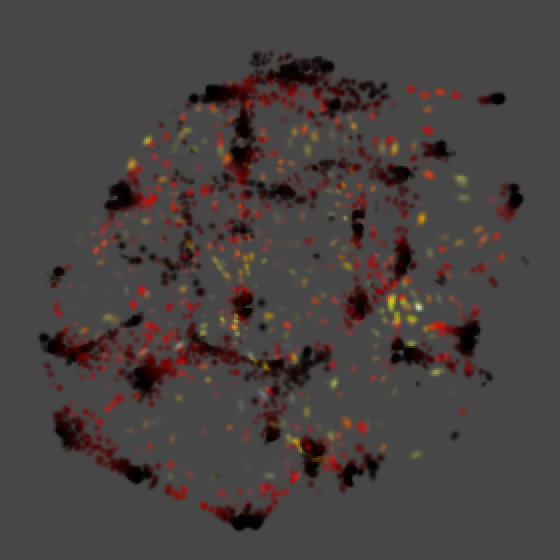 Calculated by us in yellow vs. calculated by the mesh in red. What we've done so far is approximate the partial derivatives of our noise function. They're partial because we consider the change in the X and Z direction indepdently, while keeping the other constant. Specifically, we're performing numerical differentiation using the finite difference formula (f(x + h) - f(x - h)) / 2h for all vertices except those along edges, for which we use (f(x + h) - f(x)) / h instead. In our case h is 1 / resolution, which is quite large. Using a smaller value for h will produce results that are closer to the true derivative. 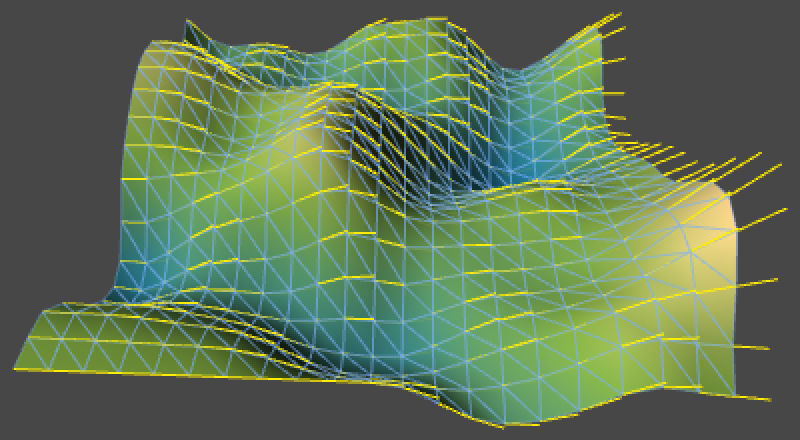 We could do that, but then we can no longer use the values of adjacent vertices. 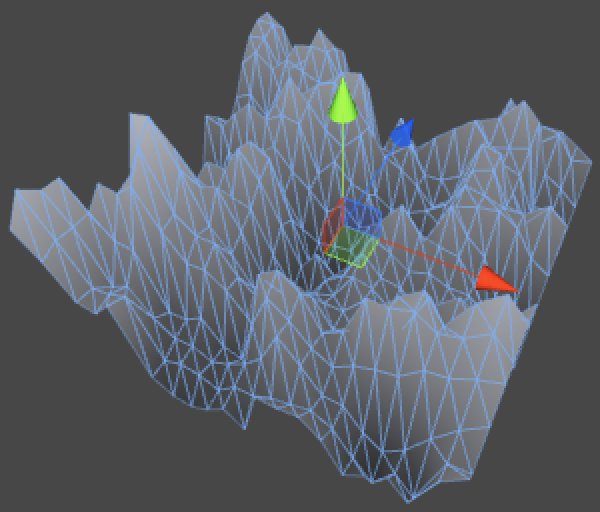 We'd have to sample the noise four additional times per vertex for most vertices. While that's possible, we must take care that we don't use too small a value for h. Because we're using floating-point numbers, we only have limited numerical precision. If h is too small, x and x + h become hard or even impossible to distinguish, which leads to significant rounding errors. Instead of taking more samples and approximate the derivatives, it is also possible to compute the analytical derivatives directly. We already know the derivative of the smoothing function we're using for our noise, why not figure out the derivative function for the entire noise as well? We get the best possible result, and it should be cheaper to compute than sampling five times. This means that our noise methods will have to return both their value and their derivative. So let's create a convenient struct that contains both. Then we change the return type of our NoiseMethod delegate type that we defined at the top of our noise script. Now all six noise methods need to be updated so they return a NoiseSample instead of a float. For now, simply assign their result to a sample's value and set all the sample's derivative components to zero. However, before we worry about how the compute the derivatives, we already know that when the frequency is increased, slopes become steeper, which means the derivatives become larger. This is actually because of the chain rule. So we have to multiply the derivative by the frequency, so let's put that in already. Only the change for Value1D is shown below, but you have to adjust the other five methods in the same way as well. With that out of the way, the next method that needs updating is Sum. Unfortunately this naive conversion doesn't work, because we're now trying to perform addition, multiplication, and dividision with entire noise samples. As it would be very convenient if this just worked – and it makes mathematical sense – why not make it so? We're going to define what addition does when performed with two NoiseSample values. We do this by adding a static method to NoiseSample and declare that is overloads the plus operator. How do operator methods work? Addition of the value is straightforward. And because (f + g)' = f' + g' the derivatives can also simply be added together. Can derivatives really be added? As it's also possible to add a single float to our sample, we should support that as well. Because the derivative of a constant is zero, we don't need to change the derivate in this case. Also, because the operands could be placed in any order, we should be tidy and support both options. We also perform subtractions, so that operator needs to go in as well. Again, we should support all versions. Next up is multiplication. Because a constant factor is simply passed on to the derivative – meaning that (cf)' = cf' – we simply apply multiplication with a float to both the value and the derivative. To be complete, we should also support the multiplication of two noise samples. In that case we have to apply the product rule to get the final derivative. Let's not bother with division now and just rewrite Sum so it uses a multiplication instead. 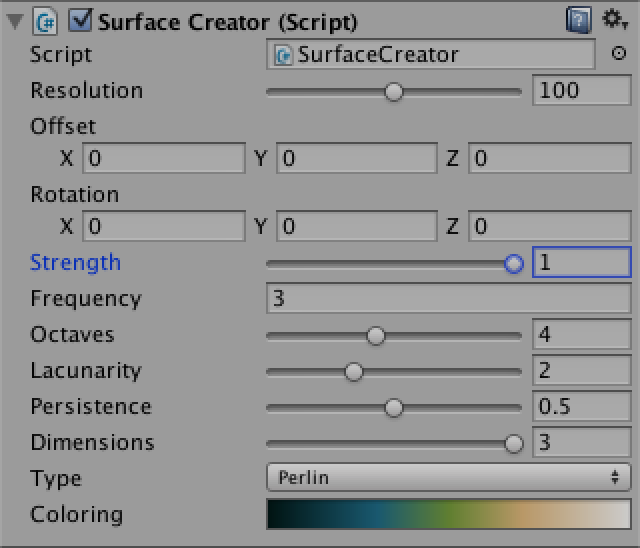 Now we have to adjust how we use the result of Sum in TextureCreator.FillTexture. As we don't use derivatives there we can simply grab the sample's value. 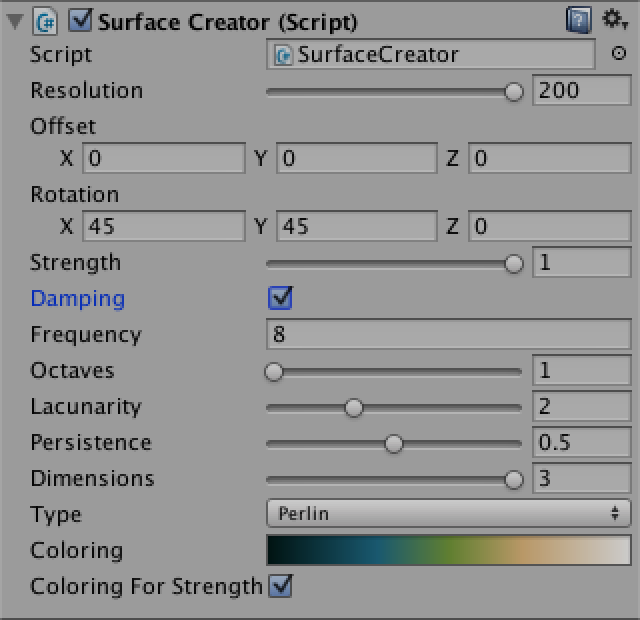 We do want to keep the whole sample inside SurfaceCreator.Refresh, so we turn sample into a NoiseSample instead of a float and extract its value when needed for the vertex color and offset. We can use the same approach as before to turn the derivative into a normal. The only difference is that we have to use the derivative's Y component instead of its Z component, because we're sampling in XY instead of in XZ. Now we can choose whether to use analyitical derivatives or stick with our numerical approach to define our normals. Let's add an option to choose between them so their results can be easily compared. Using analytical derivatives. Or not. 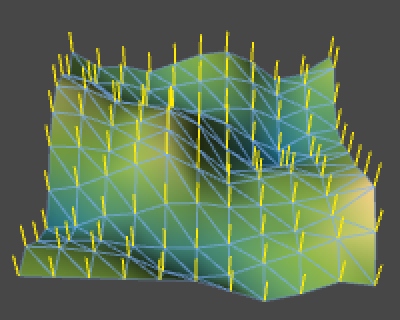 Or course our sampled derivatives are still zero, so the resulting normals all point straight up. So it's time to start calculating analytical derivatives! The first thing to consider is the Noise.Smooth method, which computes 6t5 - 15t4 + 10t3. It's derivative is 30t4 - 60t3 + 30t2, so add a method to calculate that as well. We first consider the most simple noise method that we have, which is Value1D. To recap, it determines two hash values, interpolates between them using the smooth function, and scales the result. As the scaling applies to the derivative as well, we can perform the multiplication with the whole sample just before we return it. To get the derivative of Smooth(t), we simply invoke SmoothDerivative(t) with the unsmoothed t and hold on to it. But how do we deal with the linear interpolation? Remember that linear interpolation is just a simple function. We could have directly programmed h0 + (h1 - h0)t instead of using Mathf.Lerp. As h0 and h1 are hash values, they are constants. Let's make that explicit by putting all constant components of the function into variables. The derivative of a + bt is simply bt', so that becomes our partial derivative for X. As there's no change in the Y and Z directions, those components remain zero. 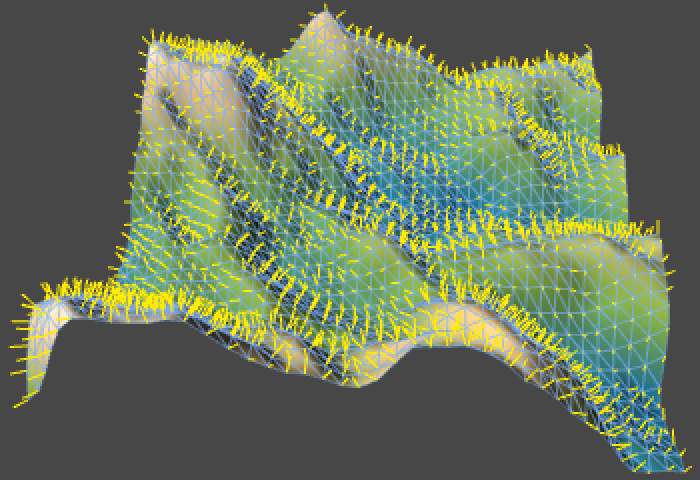 You'll notice that the numerical approach produces normals that don't always follow the shape of the mesh. 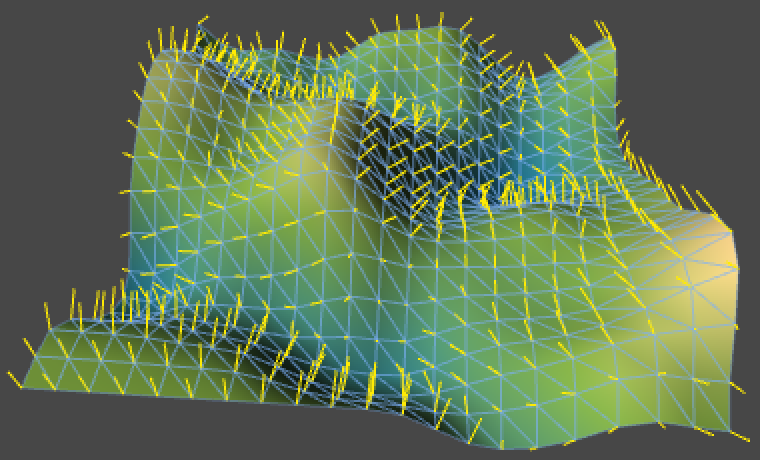 The numerical normals produce more extreme results. This is so because they adhere to the actual shape of the noise, regardless of the resolution of the mesh. This difference becomes larger as the mesh resolution decreases, or as the frequency of the noise increases. If the resolution is too low, the result will look wrong. This is a pretty good reason for using the actual mesh topology to compute the normals, instead of relying on analytical derivatives. 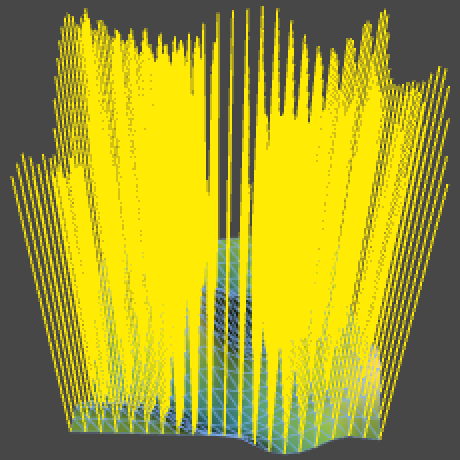 No matter how badly the mesh approximates the noise, at least its normals always look reasonable. 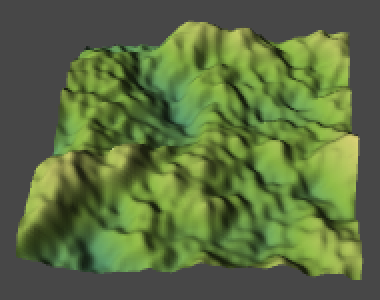 An advantage of analytical derivatives is that the edges aren't treated differently, which means you can break the terrain into multiple meshes without causing normal seams. 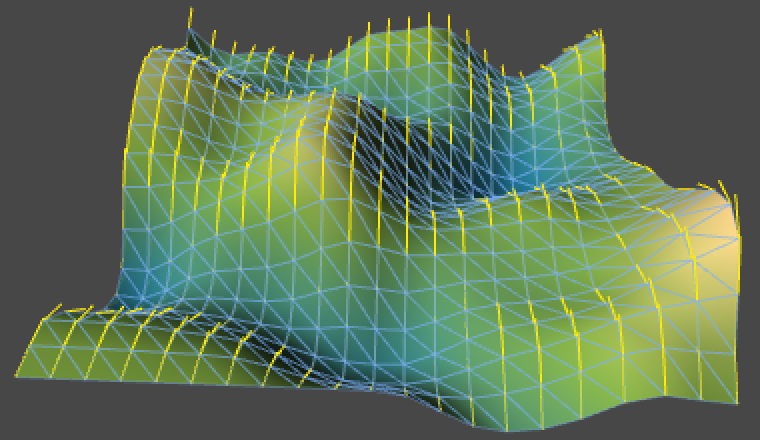 Mutiple octaves of 1D Value noise at resolution 20, analytical vs. numerical normals. 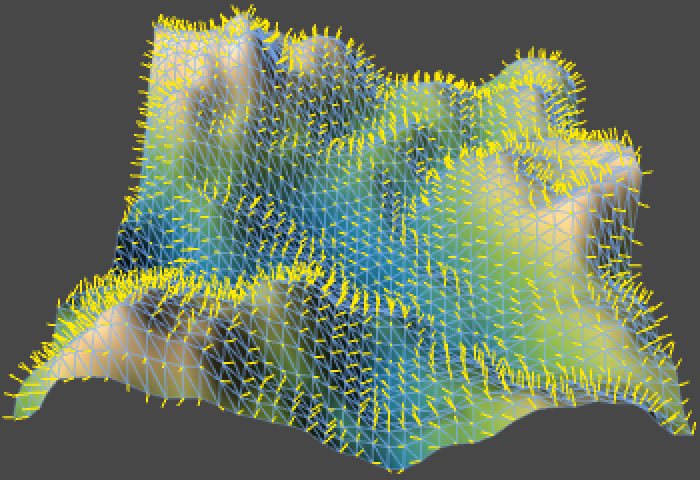 The same noise at resolution 5, analytical vs. numerical normals. While our normal calculation seems correct, it goes wrong when we rotate the noise. This is because the derivative calculation doesn't care what direction X points to, but we do. So when supplying a rotated point to our noise, we have to rotate the derivative vector in the opposite direction to get the correct result from our frame of reference. We do this by multiplying with the inverse of our rotation quaterion. 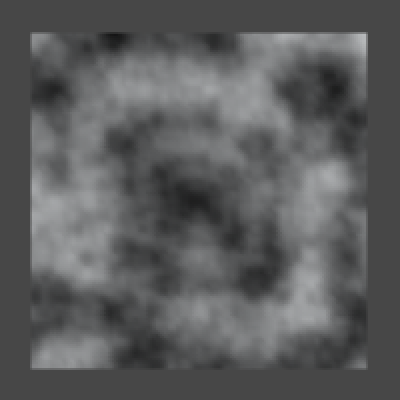 Rotated 1D Value noise, using unrotated vs. rotated derivatives. When computing the derivatives for Value2D, we have to take interpolation over two dimensions into account. We can replace the use of the nested Mathf.Lerp invocations with the large function h00 + (h10 - h00)tx + (h01 + (h11 - h01)tx - (h00 + (h10 - h00)tx))ty, which can be rewritten to get h00 + (h10 - h00)tx + (h01 - h00)ty + (h11 - h01 - h10 + h00)txty. Then we turn the hash values into constants, and end up with a + btx + cty + dtxty, which is a lot more manageable. Note that we can rewrite our new function to a + cty + (b + dty)tx. Because ty is held constant when determining the partial derivative for X, it simply becomes (b + dty)tx'. As we can also rewrite our function to a + btx + (c + dtx)ty, the partial derivative for Y becomes the function (c + dtx)ty'. 2D Value noise, using analytical vs. numerical normals. When you apply the same approach to Value3D, you'll end up with a quite large function of the form a + btx + cty + dtz + etxty + ftxtz + gtytz + htxtytz. In this case the partial derivative for X is (b + ety + (f + hty)tz)tx' and the other two partial derivatives look similar. You might think that we don't actually use the partial derivative of Z for our mesh, but we will when we rotate the noise around the X or Y axis. 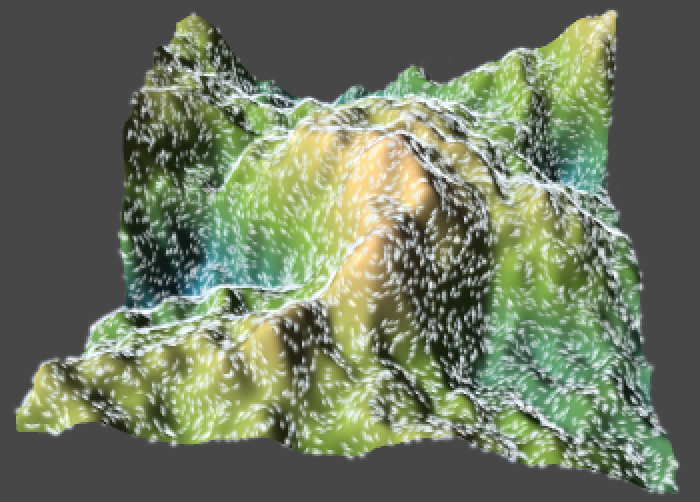 3D Value noise, using analytical vs. numerical normals. How about the analytical derivatives of Perlin noise? 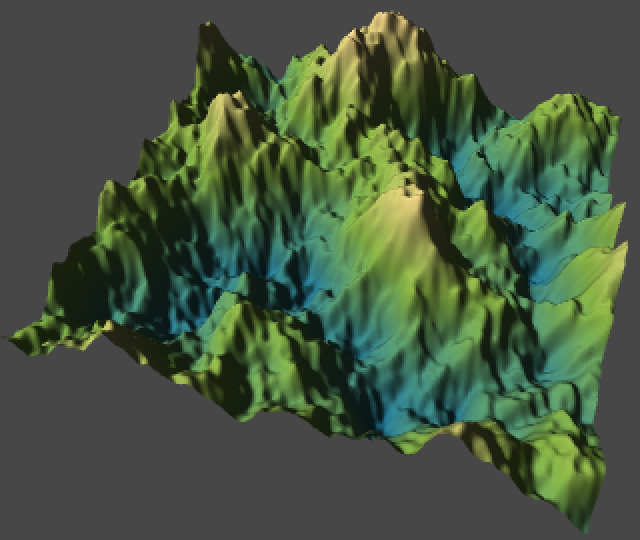 Let's start by doing the same for Perlin1D that we did for Value1D, except that we're now using gradient values instead of hash values. 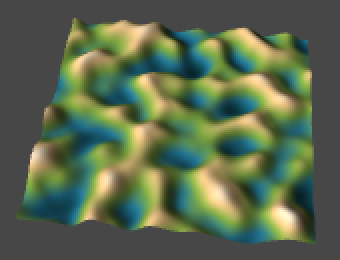 1D Perlin noise with incorrect analytical normals. The result is clearly wrong. This is because we are treating a and b as constants, while they are not. They are composed of gradients multiplied by t0 and t1, which means that we have to get their derivatives as well. Fortunately, this is easy. The derivative of v0 is simply (g0t0)' = g0. And for v1 we have (g1t1)' = (g1(t0 - 1))' = g1. These are simply the gradient directions, which makes sense. The final derivative now becomes more complex. Because a, b, and t are all functions of t0 we can no longer eliminate anything and we have to apply the product rule. Specifically, we now have (a + bt)' = a' + b't + bt'. 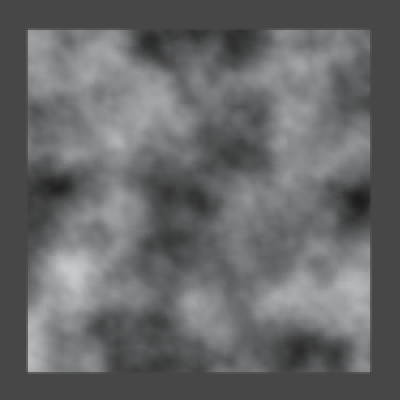 1D Perlin noise, using analytical vs. numerical normals. Compared to the Value noise derivative, what we've effectively done is add the original noise formula, but with a and b replaced by their derivatives. Technically, we could also do this for Value noise, as they become zeros in that case and it has no effect. Now consider the two-dimensional case. We calculate the noise with a + btx + (c + dtx)ty and for Value noise the partial derivative for X is (b + dty)tx'. 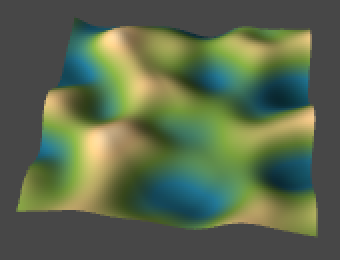 To turn this into the correct derivative for Perlin noise, we have to add the gradient formula a' + b'tx + (c' + d'tx)ty to it. 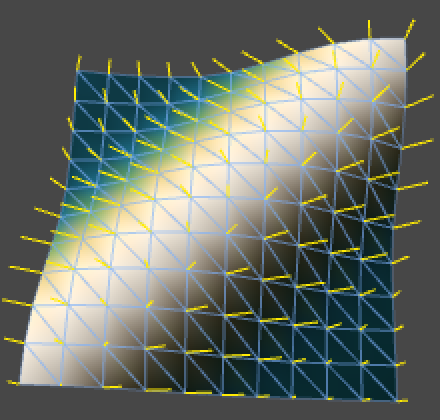 Of course the 2D gradients are 2D vectors. We have to add the X component of the gradient formula to the partial derivate of X, and its Y component to the partial derivative of Y. 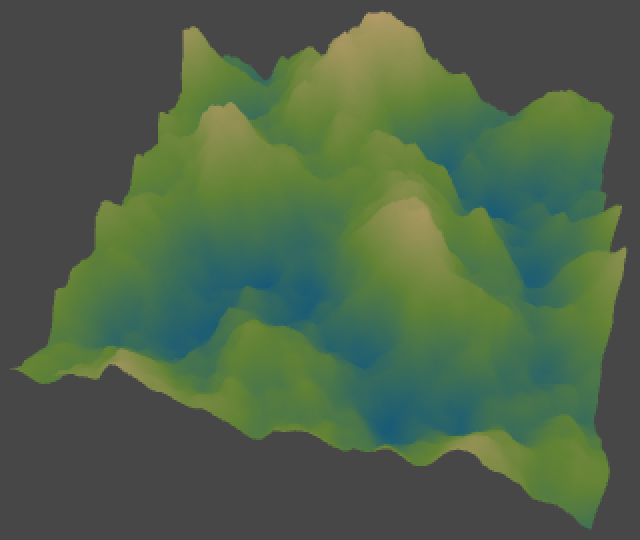 2D Perlin noise, using analytical vs. numerical normals. The partial derivatives for 3D Perlin noise become quite long, but are found using the same simple procedure. 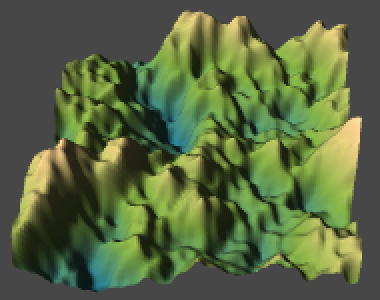 3D Perlin noise, using analytical vs. numerical normals. Because the noise derivative is a 3D vector, we could interpret it as a velocity map, which could represent stuff like movement of a liquid or gas. 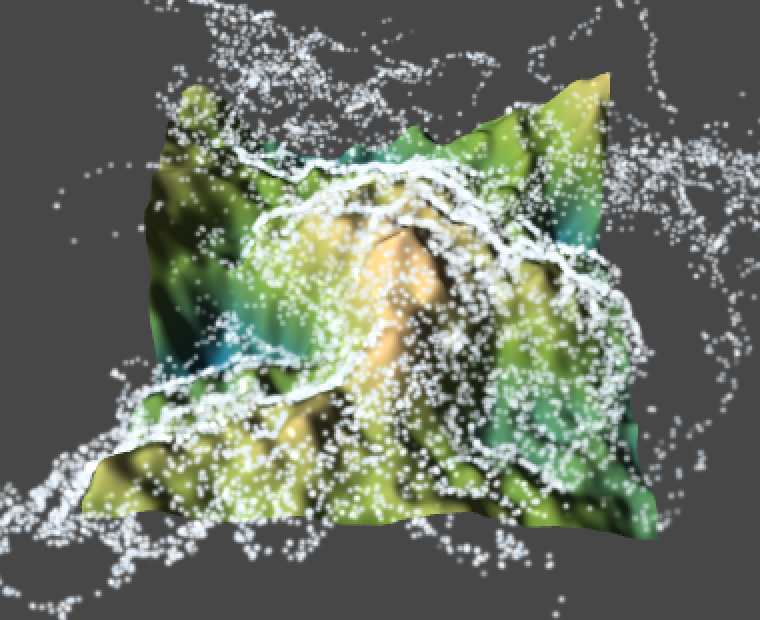 Let's create a SurfaceFlow component that visualizes the flow along our surface with a particle system. It should get a reference to our surface, so it can know what noise settings are used. 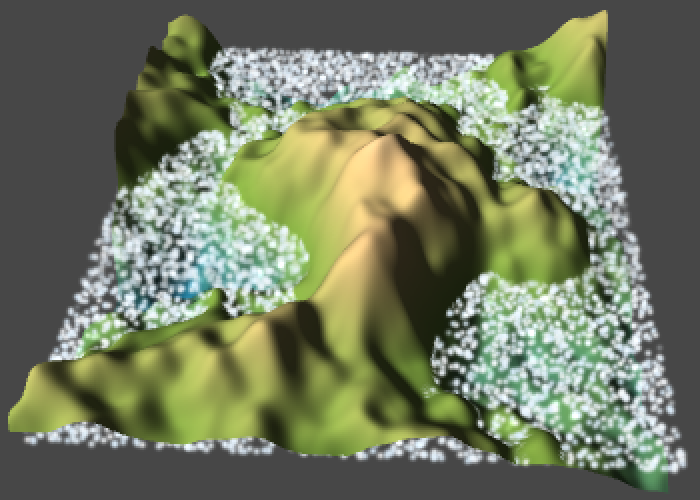 It also needs its own particle system and an array to hold the particles that it will be manipulating. To make the system fit our surface area, set its shape to a unit cube. 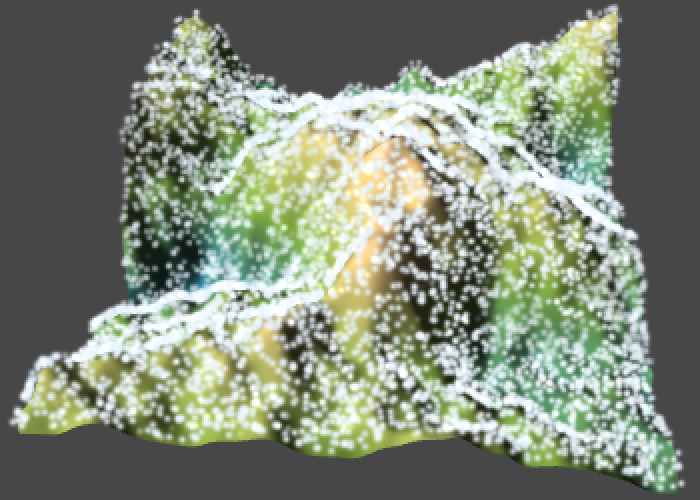 As this defines the particle spawn area and elevation will be determined by the terrain, I made the cube flat. The other settings don't matter that much, use whatever looks good to you. 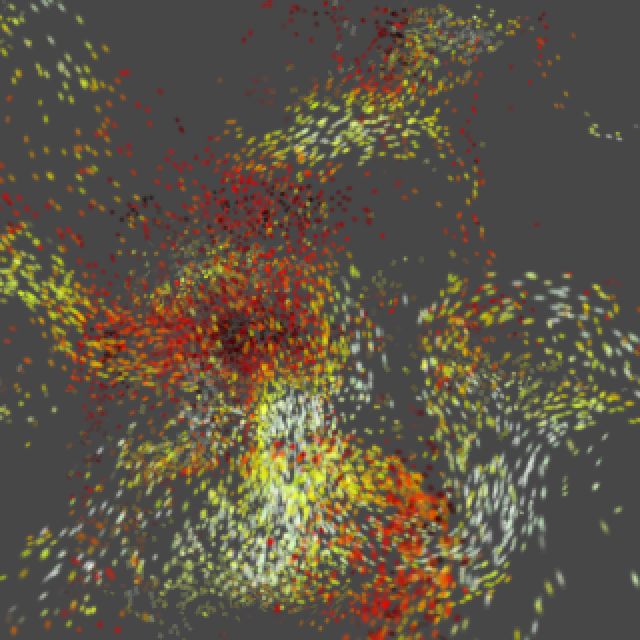 We'll leave the management of particles to the particle system. What we'll do is fetch the data of all living particles each update, manipulate their positions, and push that data back to the system. We do this via the GetParticles and SetParticles methods of ParticleSystem. 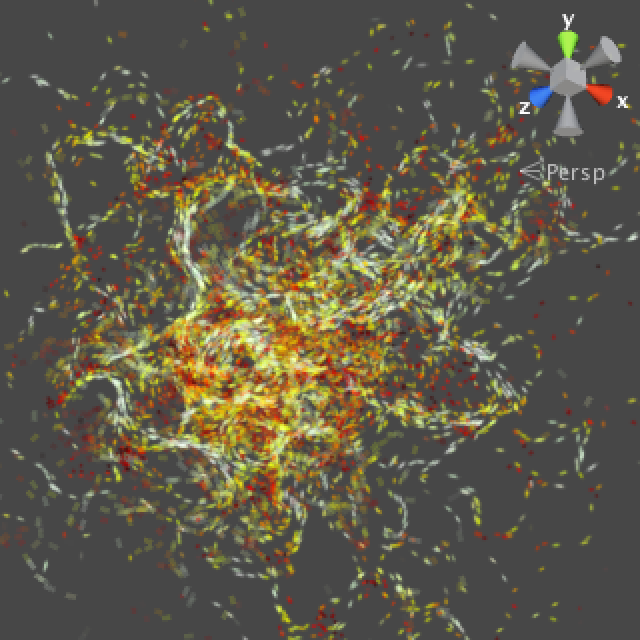 The first method copies particle data into an array that we provide and returns how many living particles were copied. The second method is used to do the opposite. Of course we also have to grab the particle system component first and guarantee that our array can hold all the particles. Actually, we'll use a LateUpdate method instead of Update. This is an alternative update method that will be invoked after regular update methods and physics calculations. We do this because we want to mess with the particles after the system has done its thing. If we don't, we might get some popping artifacts, as newborn particles won't have the correct values during their first frame. Why do I see no particles? To make the particles adhere to the surface, we have to sample the noise the exact same way as SurfaceCreator does. Only in this case we loop through all particles and use their 2D positions as input, instead of going through a vertex grid. Particles ignoring vs. adhering to the surface. 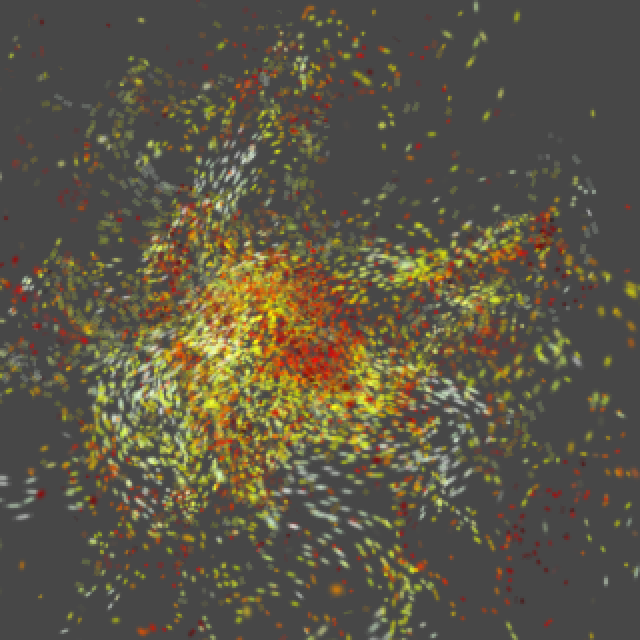 Because the particles have a size they are now partially clipped by our surface. We can solve this by simply moving them upward a bit. What would happen if we used the derivate of our noise as a velocity? We can do so by simply adding it to the current particle position, multiplied by the time delta. By setting the vertical position after this movement, we effectively ignore the Z component of the derivative. In that case the noise sample gives us the altitude where the partical was, not what it would have after it moved. But if the movement is not too large this shoudln't be much of a problem. Using the derivate as velocity. This causes the particles to immediately clump and become quite jittery, so it looks like the resulting displacement is too large. 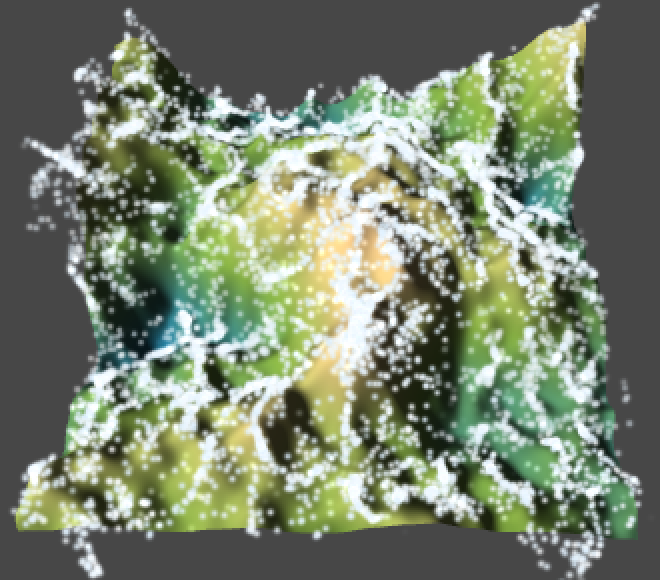 Also, because the particles are not constrained to their spawn area, they also move beyond the surface edge. Let's add a flowStrenth setting so we can bring this down to a reasonable level. Flow strength 0.10 and 0.01. When using a lower strength the clumping happens again, but slow enough that we can actually see what is happening. Indeed, there are areas that the particles quickly leave and areas where they clump until they expire. If we interpret this as gas or liquid flow, then these areas are sources and sinks where matter is added to and removed from the system. Alternatively, the matter expands and compresses. 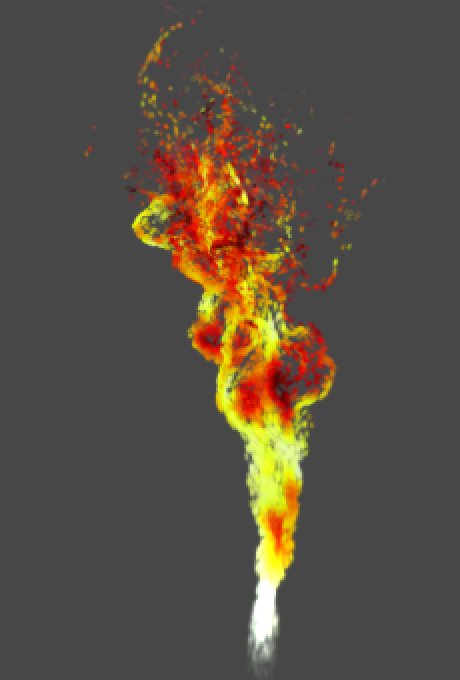 While this already produces an interesting effect, to make something that looks more realistic we have to get rid of the sources and sinks and instead simulate the flow of a noncompressible fluid. We can do this by performing the 2D curl operation on our noise, which gives us a smoothly flowing vector field. When using this field to set the velocities of our particles, they will end up flowing around the slopes of our surface. 2D curl at strength 0.25 and 0.10. If you don't like that the particles move out of the surface's area, you can simply eliminate them when they do so by setting their remaining lifetime to zero. That will recude the number of particles on the surface as well though, because some of the particles that leave the surface would have eventually returned to it. 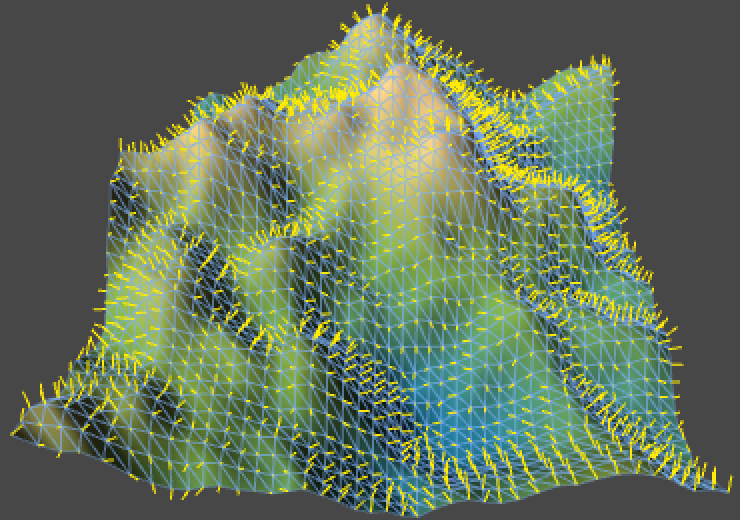 We've now seen 2D curl noise in action, but what would it look like in 3D? Let's make a new scene to find out! Create a Flow3D component, to distinguish it from our surface flow component. 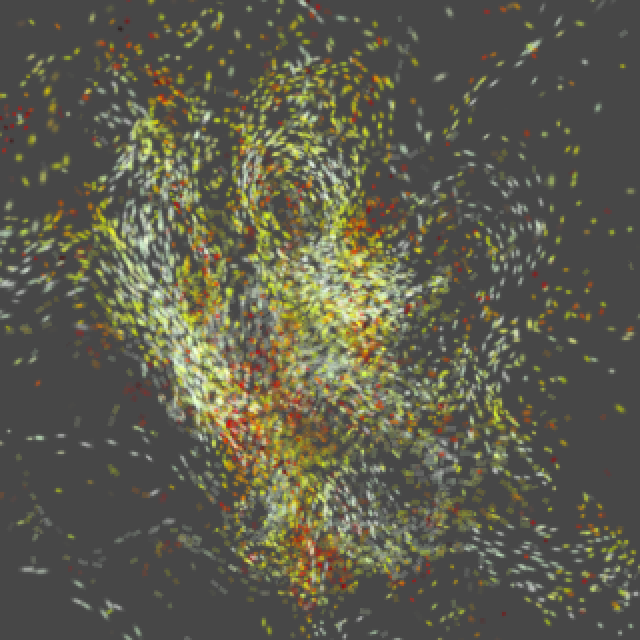 It has the same particle system logic, and it also needs its own noise settings. It doesn't need a separate flow strength variable, as the noise strength serves the same purpose. This time, don't directly set the position of the particles, instead set their velocity and let the particle system figure it out from there. 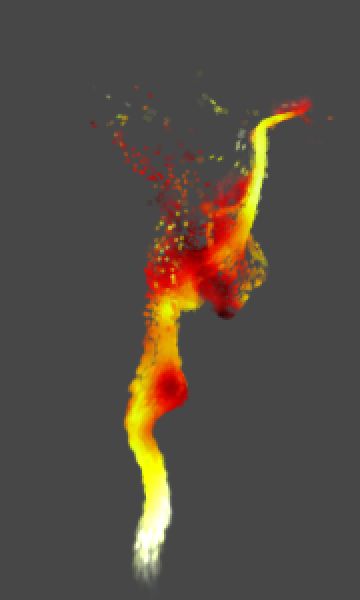 That way you can configure the system to color and stretch the particles based on their speed, which looks nice. I chose a gradient that makes it look like particles start to glow as they move faster, but you can use whatever settings you like. I also now use a sphere for the spawn shape. 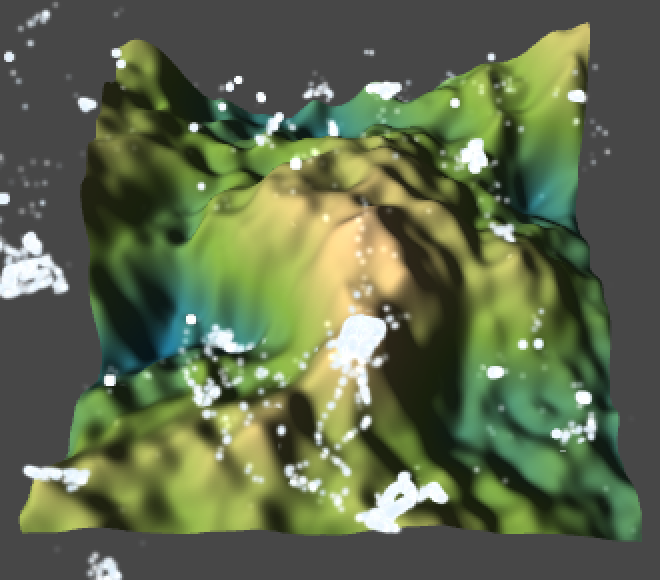 Using derivatives of Value and Perlin noise as velocities. Of course we need to apply the curl operation to get a proper flow. Let's start naive and use only one noise sample to compute it. Flattened noise, shown head-on and from the side. While this does appear nice from a certain viewpoint, when observing the resulting noise from multiple angles it becomes clear that the result is flat. All particles move in a plane that has (1,1,1) as its normal, which makes sense because all three components of our source vector fields are equal so we end up with a 1D rotation. So we have to take three noise samples. To make them different, we simply add offsets in different directions. 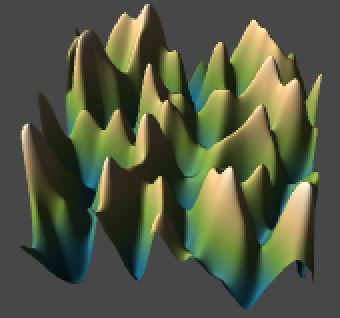 3D Curl, using frequency 1 Value and Perlin noise. It is possible to swap components of our sample points – transforming the noise result as well – as long as we also swap them in the curl calculation. For example, we can swap the X and Z components for Sample1. This doesn't seem very useful, but we can do it for all three samples so that the curl is computed using X and Y components only. This means that we could technically get away with three samples of 2D noise, which is a lot cheaper to compute, especially when using multiple octaves. 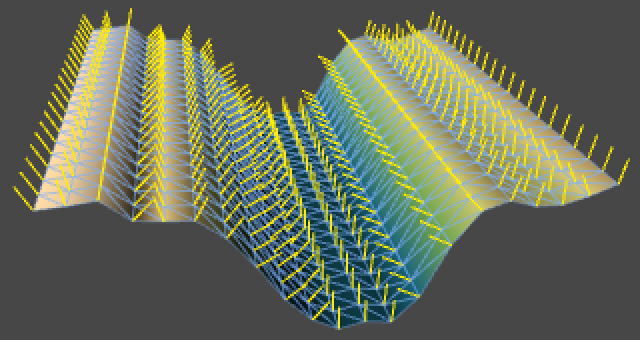 Even though this means that part of the equation does not vary in each direction, combining three 2D samples still leads to acceptable results. 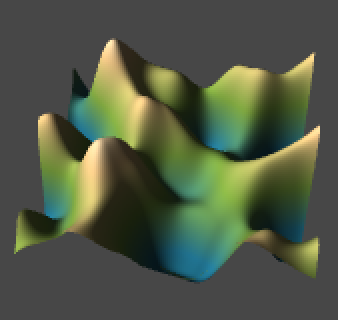 3D Curl, using 2D Value and Perlin noise. You can also create a flow that changes over time by adding an increasing offset to the noise. 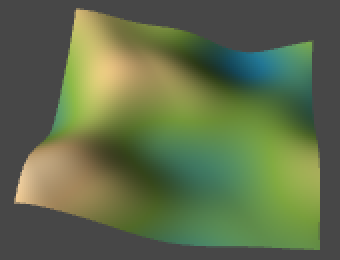 Adding to the Z component of 3D noise is an obvious choise. 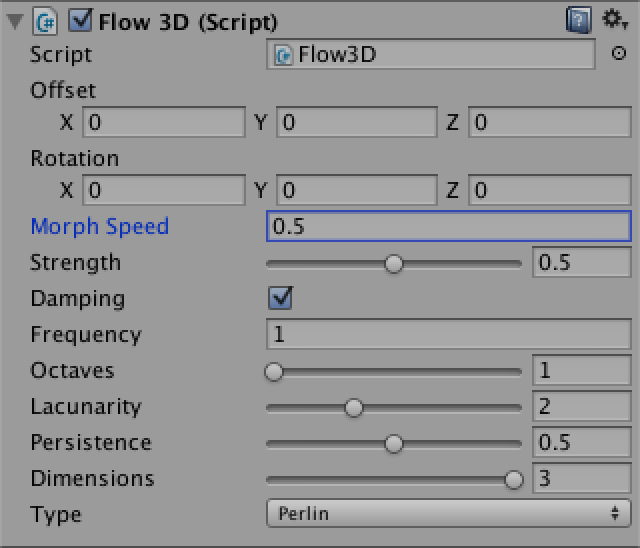 You typically want to keep the morph speed slow so the flow evolves slowly and smoothly. We implement our offset by incrementing a variable each update. As we'll get numerical precision problems if it would grow too large, we wrap it at 256, which coincides with the period of our noise. 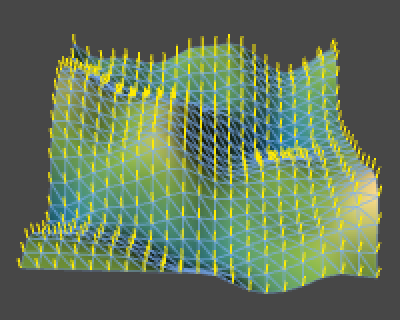 Another fun thing you can do is manipulate the vector field before applying the curl operator. As long as it remains smooth, the curl operation will produce a divergence-free field. For example, we could adjust the field so that we end up with a vertical velocity. But we might as well directly add this velocity. We could even make it decrease with height, so upward movement dominates at the bottom but the noise dominates at the top. If you decrease the size of the spawn area – say to 0.1 – you'll get a focused flow of particles that branches outward the higher it gets. Can we really just add the velocity? 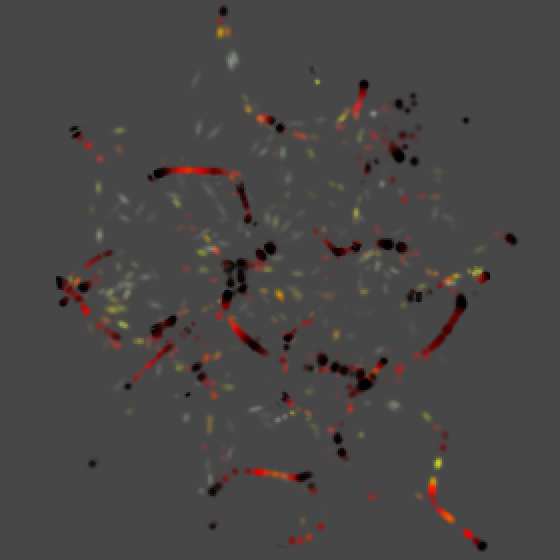 Rising particles using Perlin and Value noise, one and two octaves. That's it! Have fun cooking up nice terrains and flows. The project after Setting the Scene. The project after Creating a Mesh. The project after Making a Noisy Surface. 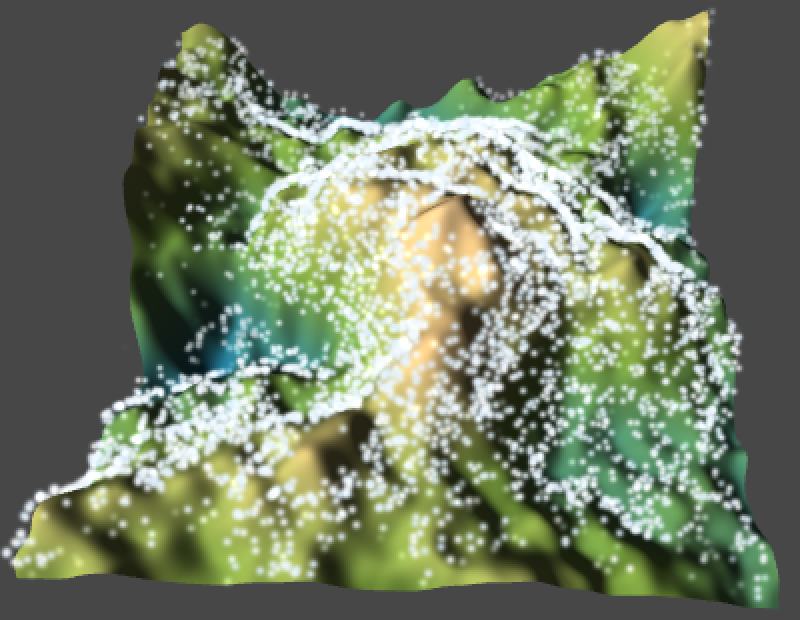 The project after Scaling the Displacement. 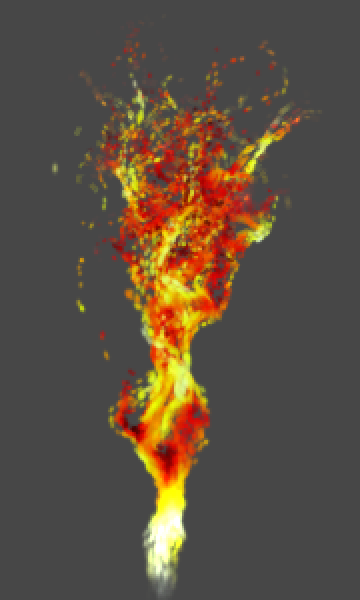 The project after Calculating Normals. The project after Using Analytical Derivatives. The project after Dealing with More Dimensions. The project after Computing the Derivatives of Perlin Noise. The project after Flowing Through Noise. Conceptually, a Mesh is a construct used by the graphics hardware to draw complex stuff. It contains at least a collection of points in 3D space plus a set of triangles – the most basic 2D shapes – defined by these points. The triangles form the surface of whatever the mesh respresents. Often, you won't realize that you're looking at a bunch of triangles instead of a real object. You can add the RequireComponent attribute to a component to indicate that you need another type of component to be attached to the same game object that your own component is. Unity will check whether this is the case when adding yours, and if not will add the required ones first. Unity will also disallow removal of required components via the editor. However, you could still destroy them through scripts, so there's no hard guarantee they'll always exist. The attribute has a version with one and two arguments. If you require more components, you'll have to add the attribute multiple times. A normal is vector that is perpendicular to a surface. We always use normals of unit length and they point to the outside of its surface, not to the inside. Normal vectors can be used to determine the angle at which a light ray hits a surface, which is used to determine the diffuse term of the lighting calculation. Specifically, it is the dot product of the normal and the light direction, as long as the result is positive. A negative result means that light is coming from behind it, in which case the surface is unlit. The normal is also used for other parts of the light calculation, in more complex shaders. 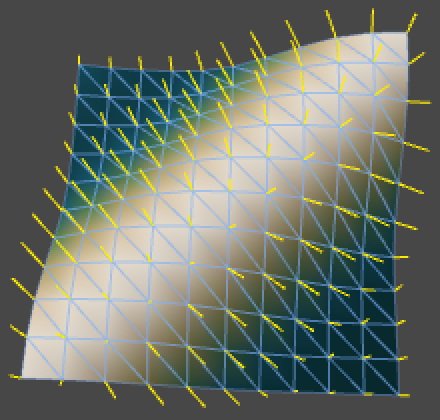 The Mesh.RecalculateNormals method basically computes the normal of each vertex by figuring out which triangles use the vertex, determining the normals of those triangles, averaging them, and normalizing the result. 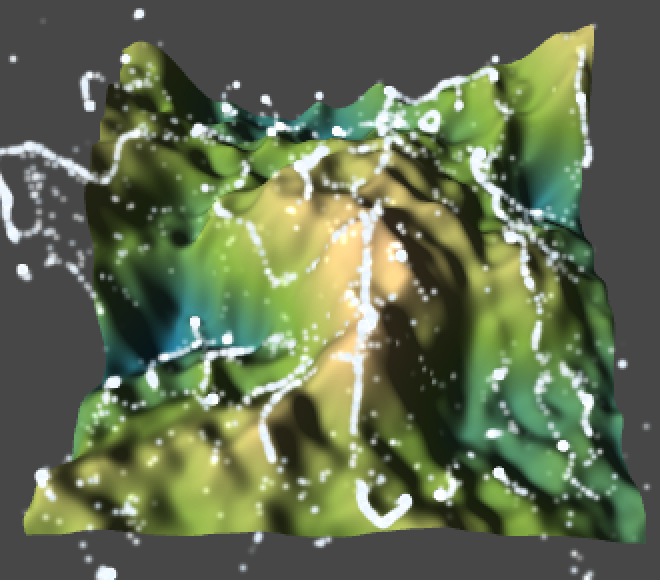 This gives pretty good results that fit the mesh topology well. 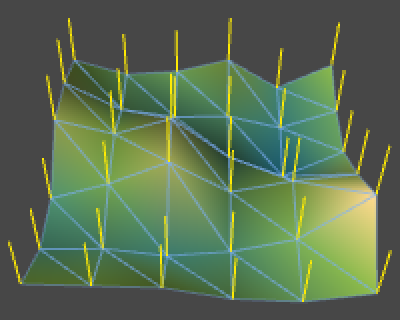 However, in the case of a grid the vertices along the edges are used by fewer triangles, so their normals are not as balanced as the other normals. Gizmos are visual cues that you can use in the editor. By default they're visible in the scene view and not in the game view, but you can adjust this via their toolbars. The Gizmos utility class allows you to draw icons, lines, and some other things. Like with Handles, they are drawn directly in world space, so you have to manually transform vectors into the local space of objects to have them move along with them. I neglected to do that for our surface because I'll never move it, so its local space is the same as world space. The cross product of two vectors is an operation that produces a vector that has two interesting properties. First, it is perpendicular to the plane formed by both vectors. Second, its length is equal to the surface area of the parallelogram that has the vectors as edges. For example, the cross product of unit vectors pointing right and forward also has unit length and points either down or up, depending on the order of the operands. Mathematically, the dot product for 3D vectors is defined as (x, y, z) × (a, b, c) = (yc - zb, za - xc, xb - ya). How can we index our one-dimensional vertex array based on (x,z) coordinates? Because we defined the vertices as successive rows along the X axis, the indices of the first row of vertices are simply x. So the indices of the second row are also x, plus an offset equal to the length of a row. The third row adds twice that offset, and so on. In general, the vertex index is zr + x, where r is the vertex row length, which is resolution + 1. The chain rule states that f(g)' = f'(g)g'. For example, consider f = 2t3 - t. Its derivative is f' = 6t2 - 1. Now consider that g = 2t and we're using g as input for f instead of t. Then we have 2g3 - g = 2(2t)3 - 2t = 16t3 - 2t. The derivative of that is 48t2 - 2. If we use the chain rule instead, we get (6(2t)2 - 1)2, which rewrites to the same result. Applied to noise samples, it means that if we multiply our sample point by the frequency, the derivative of that is the frequency itself, so we have to multiply the sampled derivative by the frequency to get the correct result. You could define the sample point's components in more exotic ways. For example, you could use (x, 2y, z2), in which case you'd have to multiply the partial derivatives by 1, 2, and 2z, respectively. However, the partial derivatives are computed by keeping the other dimensions static. So our approach will fail for sample points like (x + y, y, z). Operator methods are simply static methods that masquerade as an operator, just like properties are methods that pretend to be variables. Yes, methods are hidden everywhere. You're able to directly add Vector3 values together because Unity has defined an operator method for it. You should only overload operators this way if the result is obvious and makes sense, just like a method named Add should add stuff. For example, Unity has no multiplication method for two vectors, because there is no universal interpretation of what that should do. Note that because a += b is shorthand for a = a + b, both cases are covered when overriding such an operator. Yes they can, because the parts of a function are differentiated independently. For example, (t3 + 2t)' = 3t2 + 2. In this case we can consider f = t3 and g = 2t. The product rule states that (fg)' = f'g + fg'. As an example, consider the case f = t3 - 5 and g = 2t2. In that case we have f' = 3t2 and g' = 4t. Then f'g + fg' = (3t2)(2t2) + (t3 - 5)(4t) = 6t4 + (4t4 - 20t) = 10t4 - 20t. If we don't use the product rule then (fg)' = ((t3 - 5)2t2)' = (2t5 - 10t2)' = 10t4 - 20t, which is the same result. If you end up in a situation where the particle system doesn't show anything, it's turned off. 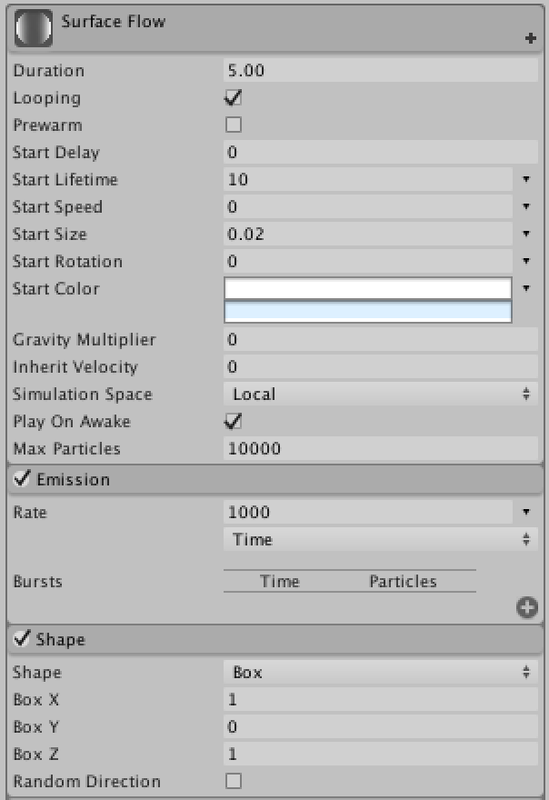 You turn it back on by clicking the Simulate button in the Particle Effect panel. 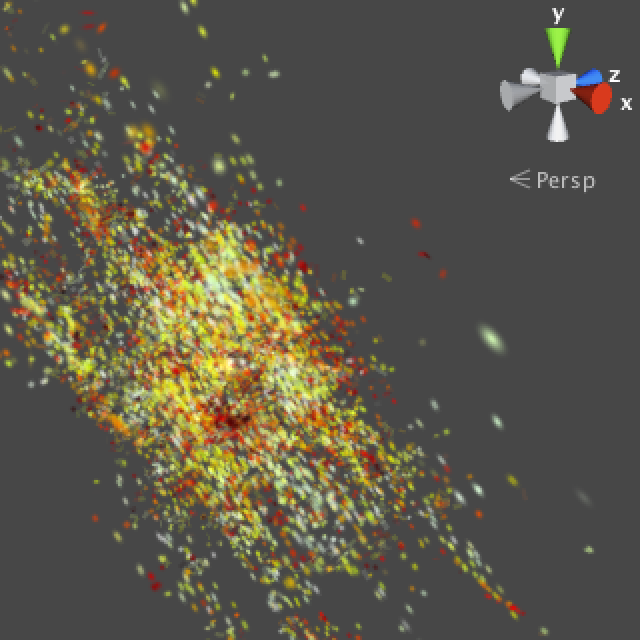 It is visible in the scene view when you have the particle system selected. The curl operator measures the rotation inside a vector field. Imagine that you are floating in a river. If all the water around you flows forward equally fast, then you are simply pushed forward as well. But if the water on your left happens to flow faster than the water on your right, you will be pushed forward harder on your left side than on your right side. You will start to rotate clockwise. Of course, sideways water movement influences the rotation as well. That the curl operator gives us a measure of rotation is nice, but the main point is that when applied to a smooth vector field, the result is divergence-free, meaning that it gives us an incompressible velocity field. In three dimensions, given some vector field F = (Fx, Fy, Fz), the curl operation yields a 3D rotation vector and is defined as (δFz/δy - δFy/δz, δFx/δz - δFz/δx, δFy/δx - δFx/δy). Here δ (delta) means rate of change. So the Y component is equal to the rate of change of Fx along z minus the rate of change of Fz along x, which matches our water example. If we use noise samples for Fx, Fy, and Fz, then our noise derivatives directly give use the rates of change that we need. Note that we cannot directly use the noise derviate vector for F. Well, we could, but then we'd still need to figure out the derivatives of all its components in all three directions, so there's no point in doing that. If we are only interested in a 2D result, then we can eliminate the third component and δz from the equation, so we end up with (δFz/δy, -δFz/δx). As we are only using one component of F now, we can suffice with a single noise sample. The use of the curl operator to simulate fluid flow was first mentioned in a paper by Robert Bridson et al. Yes. We want to add some vertical velocity to the result. That means we have to increase the Y component of the curl result, which is δFx/δz - δFz/δx. We could do that by increasing δFx/δz. 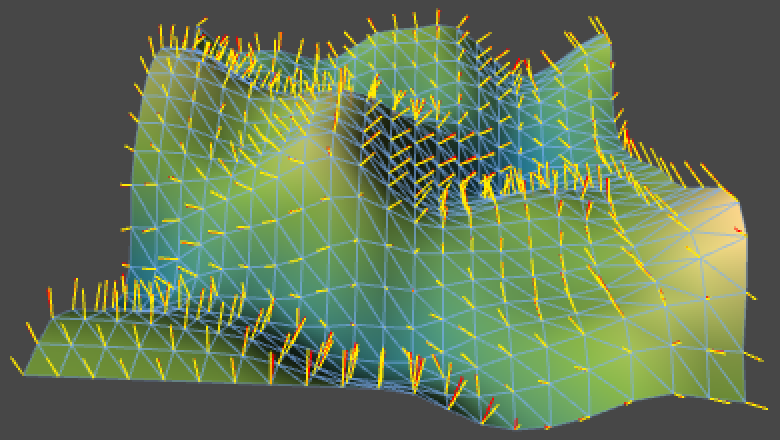 So we add a vector field to Fx that smoothly increases in the Z direction and is contant in the other two directions. For example, we could add (0,0,z) to Fx, which is smooth so Fx + (0,0,z) is smooth as well. This means we add (0,0,1) to δFx, which leads to (0,1,0) being added to the curl result. We can add a different field and end up adding (0,1 / (1 + y),0), we just don't bother figuring out what it is. But if you insist, (0,0,ln(1 + y)) is a suitable field.